Strzegom granitic massif (Lower Silesia, Poland) is a classic European locality famous for pegmatites hosting collector quality crystals (read more about it here). More than ninety species have been identified from Strzegom pegmatite cavities. 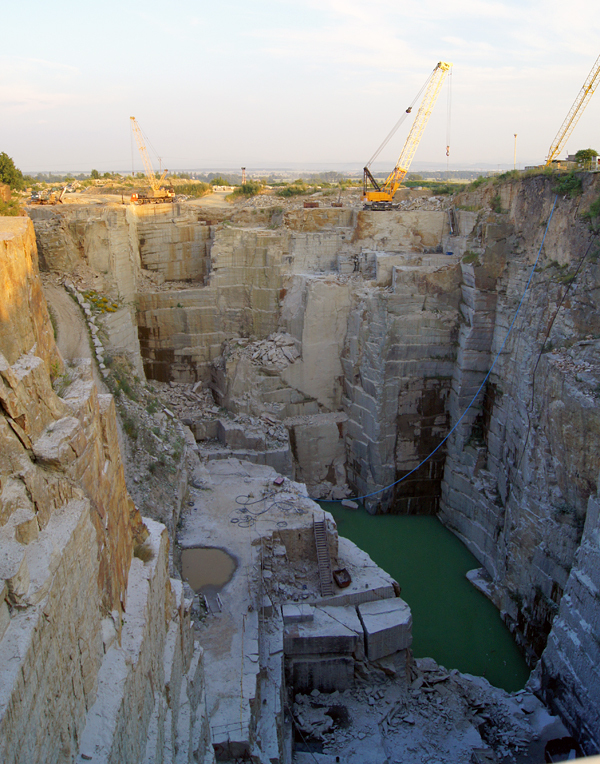 There are over 40 working quarries there, but since 2012, because of the world economic crisis, exploitation has been gradually reduced. 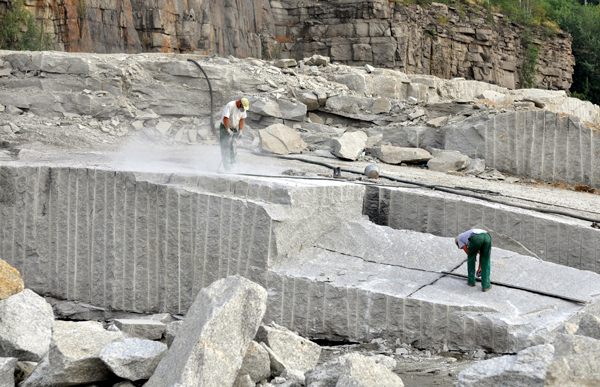 Now only small fraction of the quarries are worked as intensively as they were formerly. Several important finds from 2009-2011 period have already been described in Mineralien Welt magazine (see here), and here we’d like to continue the story, presenting only the most significant finds from the last 2.5 years. Location of Strzegom in the map of Poland. 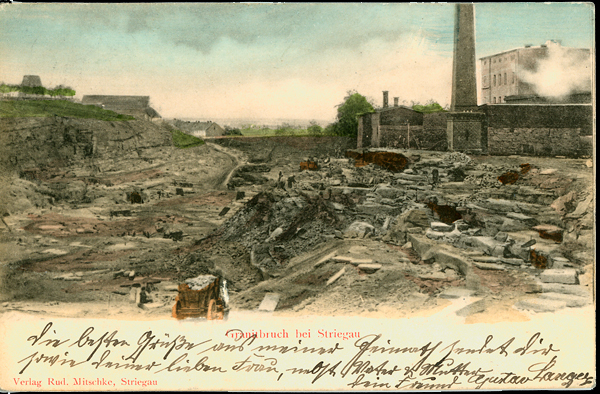 XIXth century postcard from Spirifer collection showing one of Strzegom quarries. 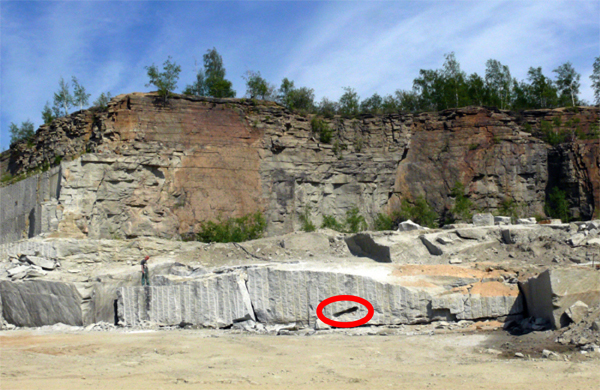 At the “Wekom II” quarry in Kostrza a medium sized pegmatite pocket, measuring 1x0.7x0.5 m, was found during blasting. 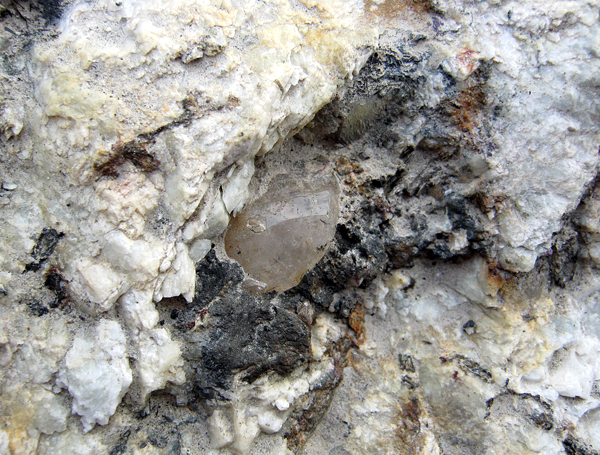 The pocket contained numerous fluorites and feldspars, quartz, stilbite and calcite specimens. 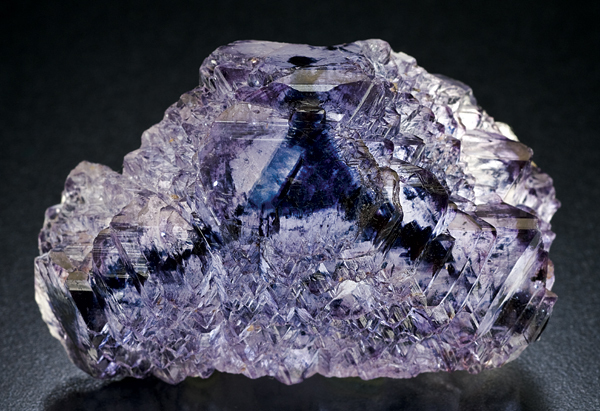 The fluorites are found in two habits– as sharp octahedrons with deep violet/blue color and as skeletal crystals with coloring zoning – in the form of a "Mercedes emblem". 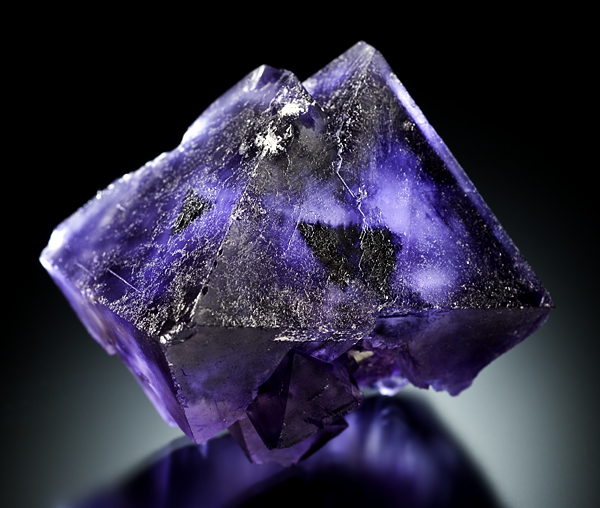 The biggest crystal of fluorite collected from the cavity is about 10 cm (but it was of low quality), other crystals reached up to about 5 cm. 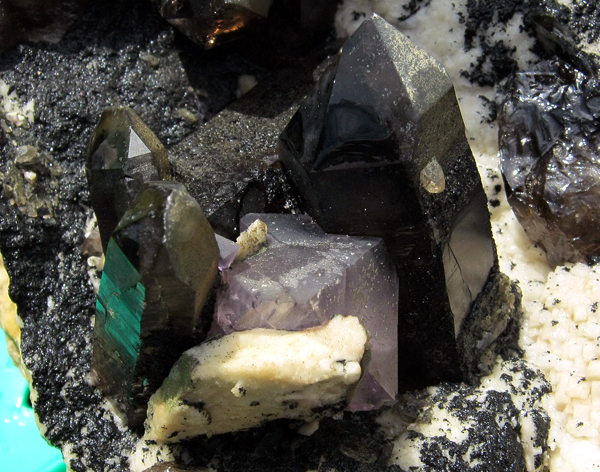 Unfortunately during blasting the majority of fluorites were destroyed, and the fluorite chips were scattered over a 5 meter radius from the cavity. 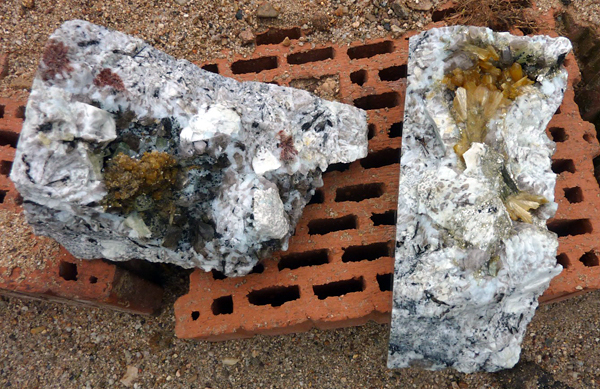 Although only a few specimens were collected from this find, among them were two very good for Strzegom fluorites. Location of Wekom II quarry in Kostrza. Google Maps. Wekom II quarry with giant cranes. J. Rakovan photo. Working area where the pocket was found. A. Korzekwa photo. 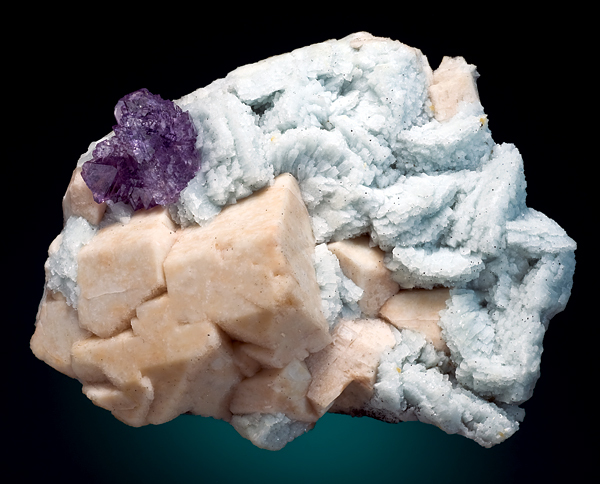 7.2 cm wide specimen with fluorite ocrahedrons, stilbite and feldspar. Spirifer collection. J. Scovil photo. Close-up of the specimen shown above. G. Bijak photo. Complex fluorite crystal with superb color zonation "Mercedes sign". J. Scovil photo. 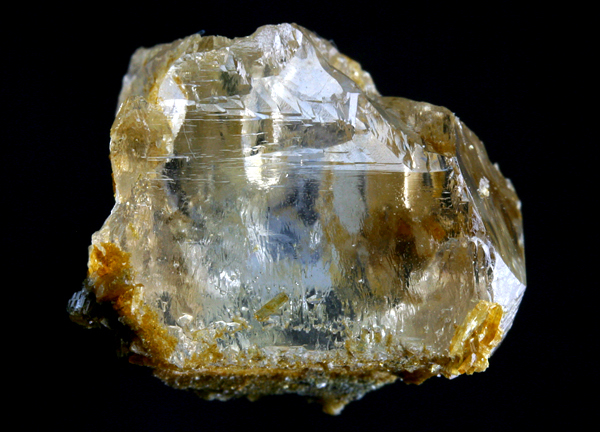 Until recently, topaz from Strzegom was known only as very small crystals, typically not exceeding a few millimeters, but in April 2010 there was a find from which a limited number of good-quality, larger topaz crystals was recovered. These are undoubtedly the best topaz specimens known from Strzegom and from Poland as a whole. 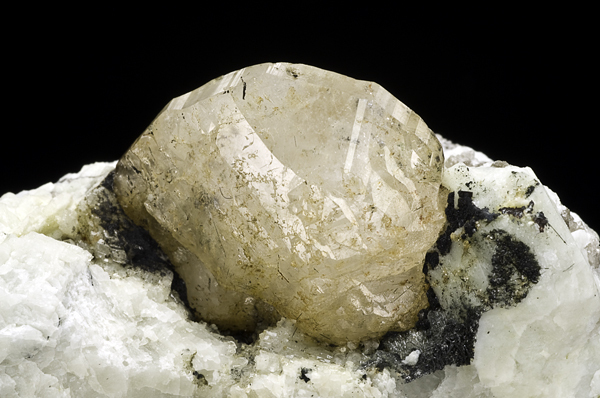 This find was described in Rocks & Minerals Magazine in 2011 (see details here). 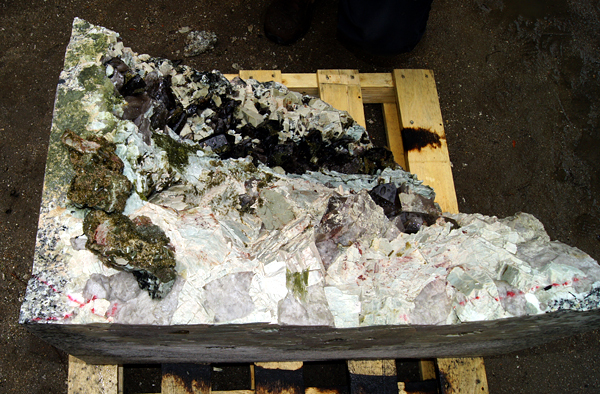 In April 2010, in the process of normal mining at the Źółkiewka I quarry, miners found an aplitic pegmatite zone with a cavity about 1.1x0.3 m in size. 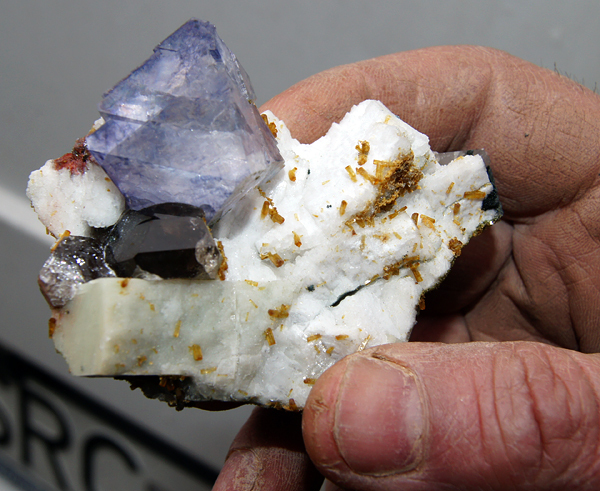 Unfortunately, local miners know little about mineral species, and they focused only on the large quartz “points” when excavating the pocket; smaller crystals did not attract them. The recovered specimens quickly reached a local dealer, who consulted with more experienced collectors, who identified the topaz crystals. There were fewer than 18 pieces with topaz, but despite the miners’ lack of knowledge most of them were undamaged. Some were of rather poor quality but about 10 specimens contained the best topaz crystals known from Poland. Eventually almost all of the good specimens went to a private collector in Krakow, with the unquestioned best specimen going to the collection of Spirifer. 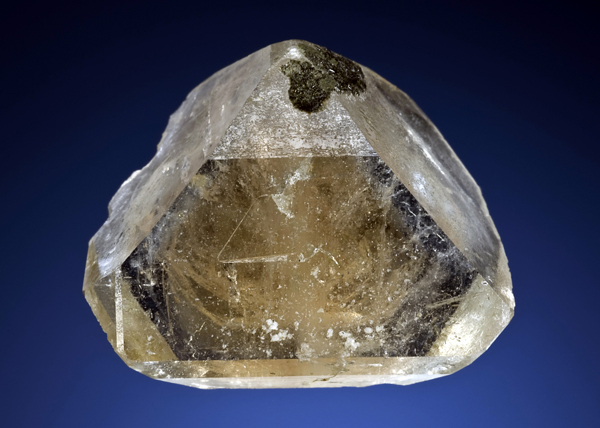 Sometime after the pocket was discovered, two Polish and one American mineralogist (Eligiusz Szełęg, Adam Szuszkiewicz, and David London) found themselves in the same quarry, and their skilled eyes noticed more topaz crystals, but few were of collector quality. They probably collected fewer than 30 crystals that were more than 1 cm long, but the best specimen they found is a partially gemmy, brown to pale blue topaz crystal, 2 cm long perched on feldspar matrix. Strzegom topaz exhibits two different habits. The first (and first generation) is of more interest to collectors, because the crystals are larger, more complicated, and show better color. 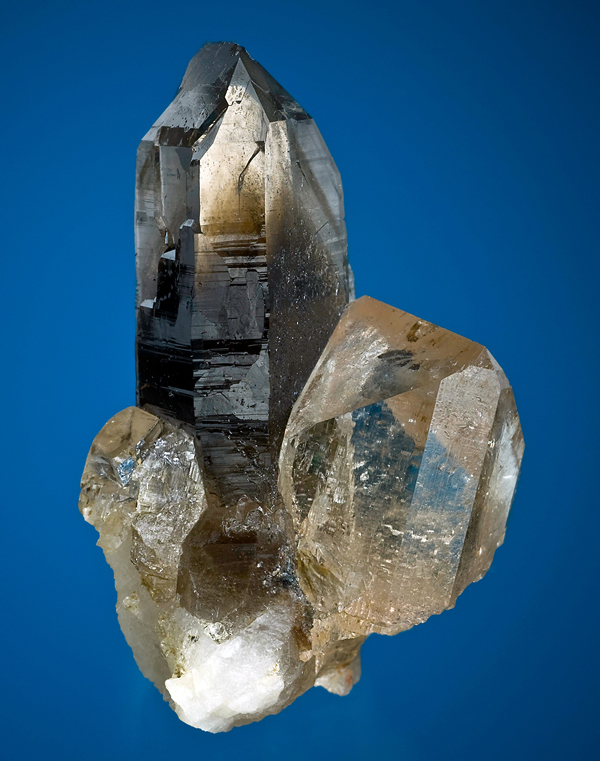 This generation of topaz grew earlier than or contemporaneous with quartz. Crystals reach 2.5 cm in length, and the best quality crystal is 2.2 cm long. Most are lustrous, but some show partially frosted faces. The color is zoned from pale brown to a champagne color, with rare bluish zones. 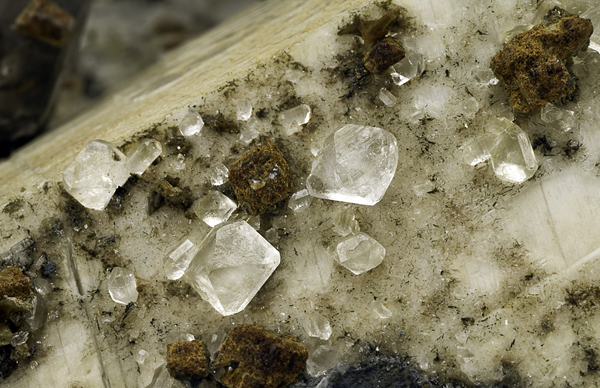 Several crystals are totally gemmy, the majority has inclusions and cracks. The second generation (younger) shows different coloring and habit. 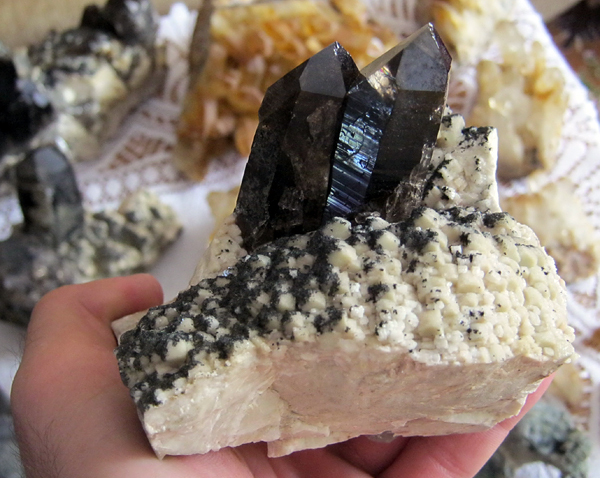 This generation is always colorless, with crystals showing high luster and often being completely gemmy. 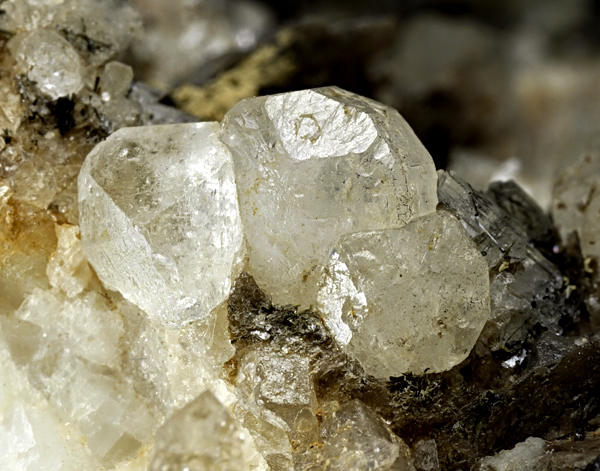 It commonly grows on microcline and albite as crystals less than 1 cm long. 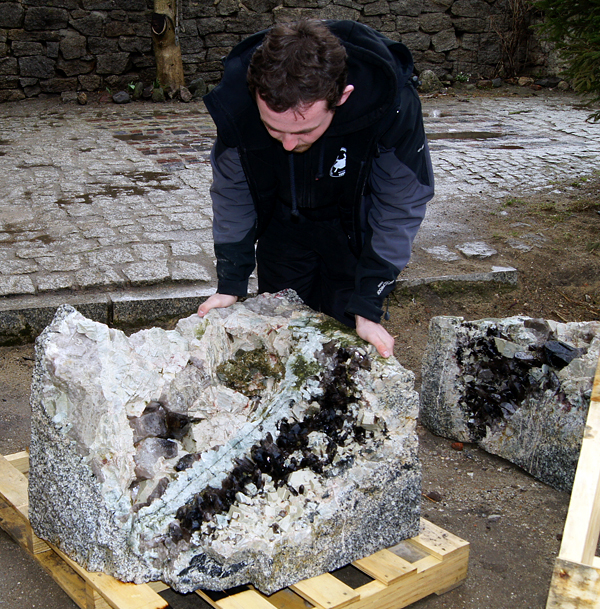 Sometime later, in May 2010 in the same pegmatite, the biggest phenakite in the history of Strzegom was found. 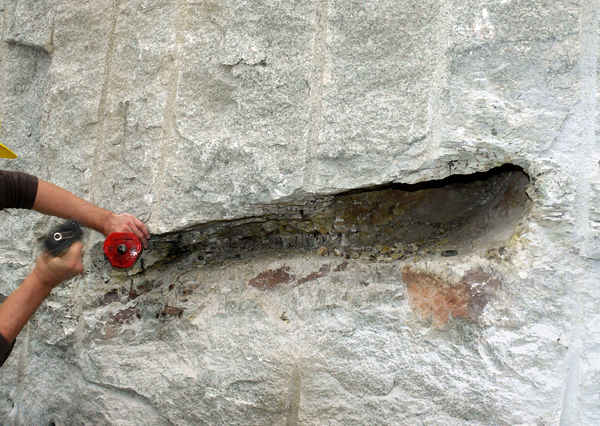 It was found a huge block of granite, so it was necessary to bring a saw and a generator to cut it out with some surrounding matrix. 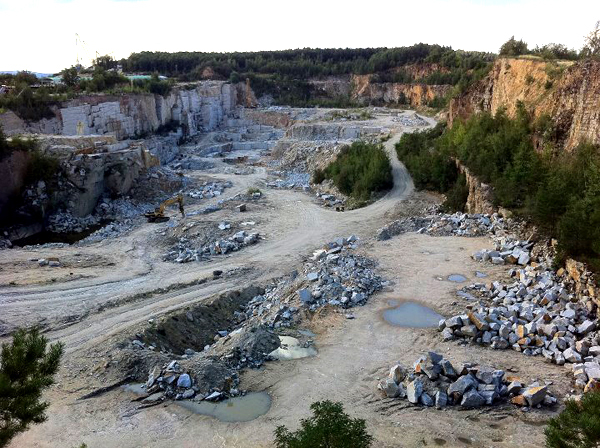 Locaton of Źółkiewka quarry. Google Maps. 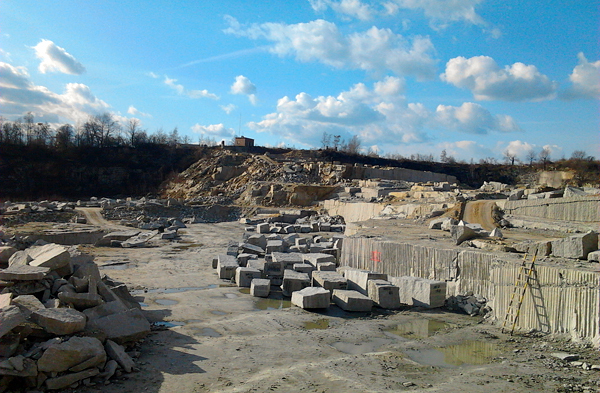 Źółkiewka I quarry. T. Praszkier photo. Workers in the quarry. T. Praszkier photo. 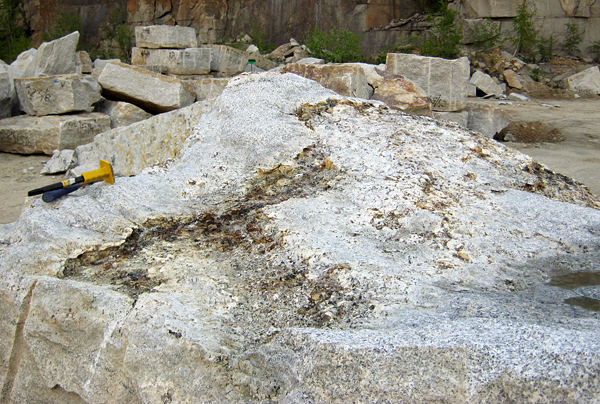 Quarry with visible pocket that produced topaz specimens. E. Szełeg photo. Adam Szuszkiewicz, Eligiusz Szełęg and David London with the pocket that produced topaz specimens. Working in the pocket with topaz. E. Szełeg photo. Smoky quartz, albite, microcoline, mica and tourmaline, specimen 7.5 cm wide. W. Góral collection. J. Scovil photo. 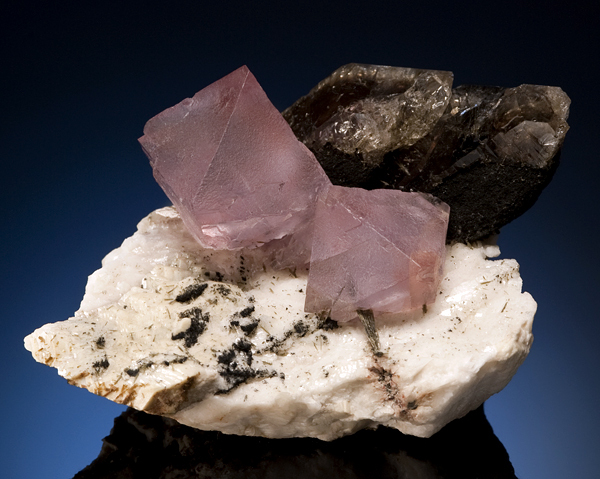 Lepidolite from the topaz pocket, specimen 5 cm wide. E. Szełęg collection and photo. 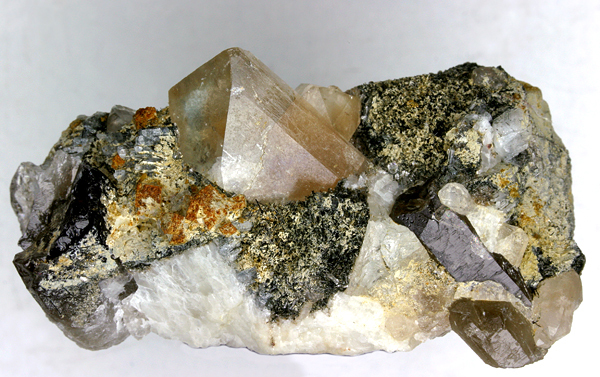 Microcoline, smoky quartz, topaz, chabazite and albite; specimen 13.3 cm wide. W. Góral collection. J. Scovil photo. 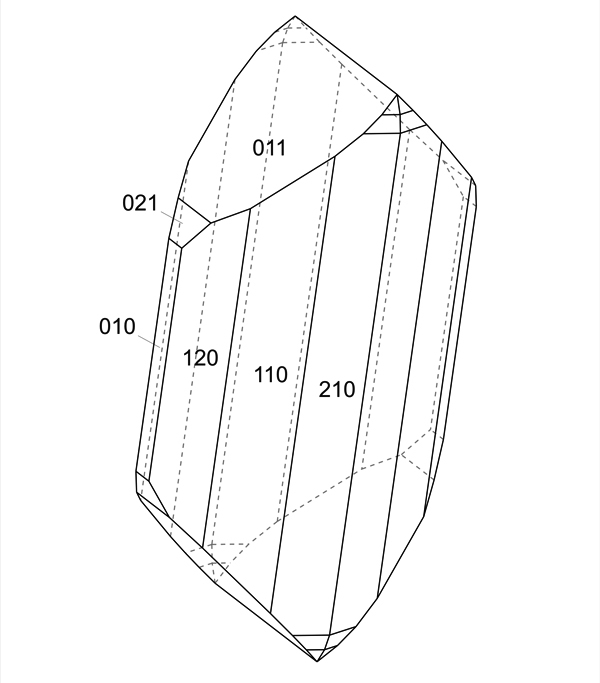 Crystallographic drawing of the younger morphotype of topaz from the find. A. Recnik drawing. Small topaz crystals of short prismatic habit, size of the crystals up to 7 mm. W. Góral collection. J. Scovil photo. 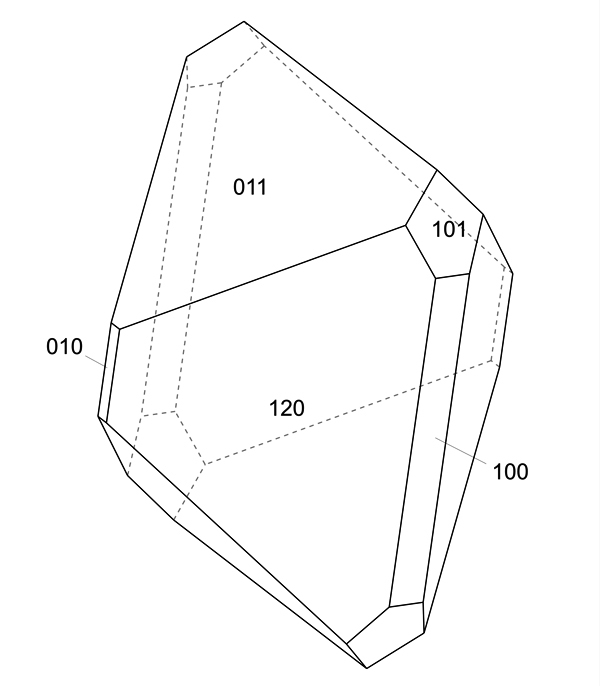 Crystallographic drawing of the older morphotype of topaz from the find. A. Recnik drawing. 2.2 wide topaz crystal with smoky quartz. E. Szełęg collection and photo. Smoky quartz, topaz, chabazite, albite and tourmaline, specimen 7.1 cm wide. W. Góral collection. J. Scovil photo. Gemmy brownish topaz crystal 3.3 cm wide. W. Góral collection. J. Scovil photo. Gem etched topaz crystal, 2.3 cm wide. E. Szełęg collection and photo. The best specimen from described find and the best topaz known from Poalnd. 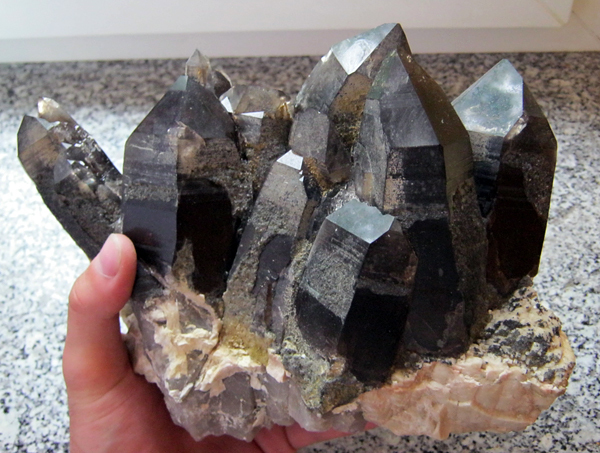 Smoky quartz with gem topaz 4.3 cm high, topaz crystal 2.2 cm high. Spirifer collection. J. Scovil photo. 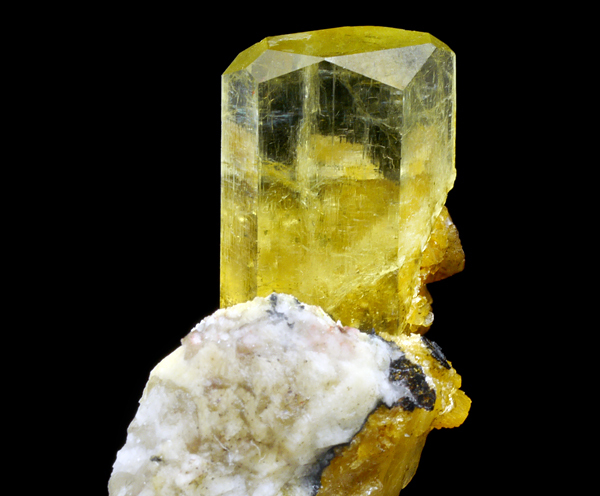 Phenakite on the top of topaz crystal, size of phenakite crystal 0.2 cm. W. Góral coll. G. Bijak photo. Group of phenakite crystals, size 0,9 cm. W. Góral coll. G. Bijak photo. 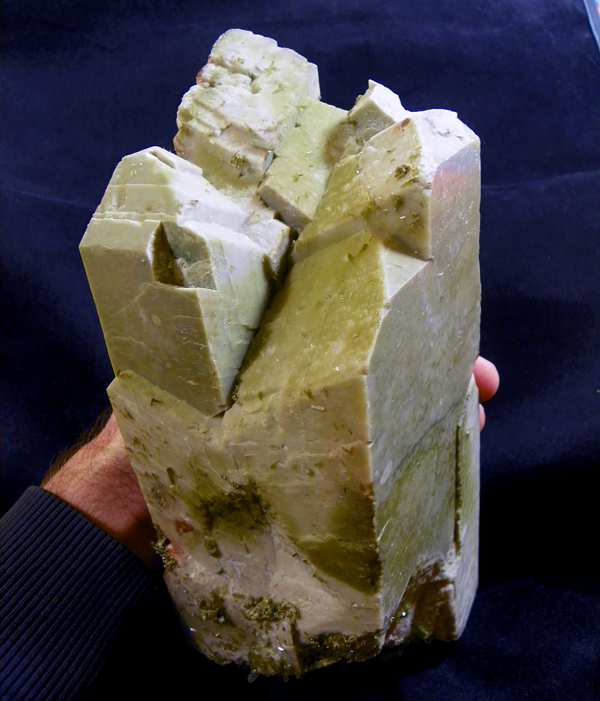 Big block with pegmatite on which big phenakite crystal was found. A. Korzekwa photo. 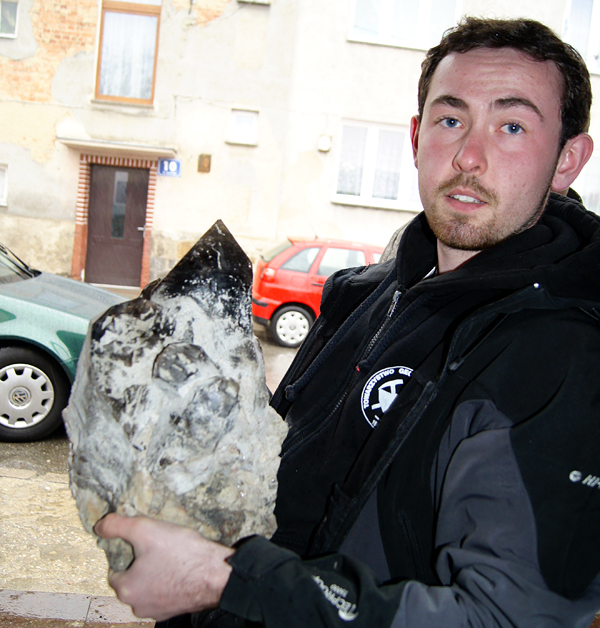 The biggest phenakite crystal ever found in Poland. A. Korzekwa photo. Working on extraction of the specimen. A. Korzekwa photo. After the first trimming. A. Korzekwa photo. 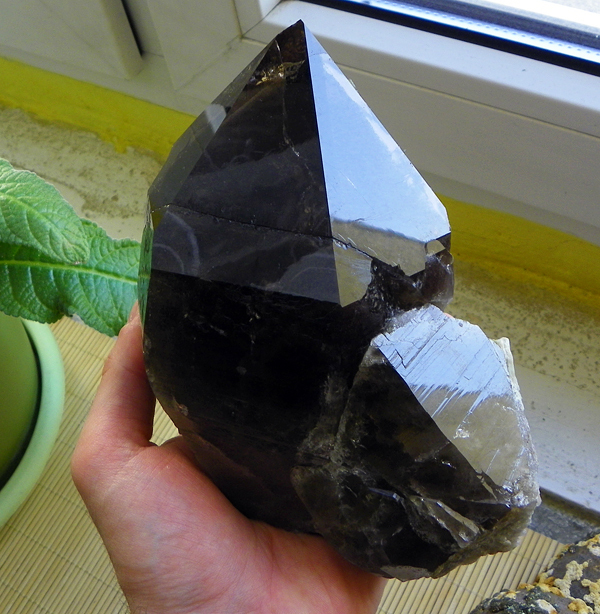 2.2 cm wide phenakite crystal, the biggest one known from Poland so far. Spirifer collection. J. Scovil photo. 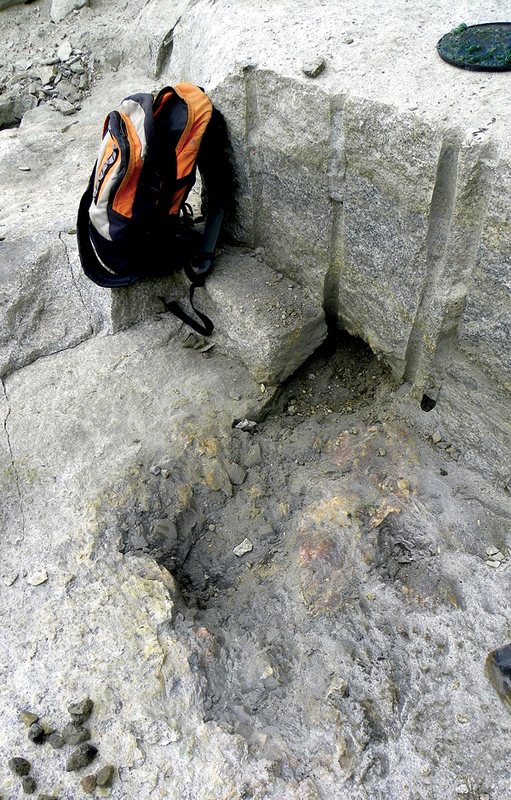 Mining in the Wekom II quarry encountered another important cavity (the first described above). The pocket was almost completely destroyed by miners during the process of extracting granite blocks. The cavity was in one of the big blocks mined for tiles. The blocks are 2x2x4 meters. Quarryman were asked to split the block to further open cavity. This they did for the price of two bottles of cheap fruit wine. 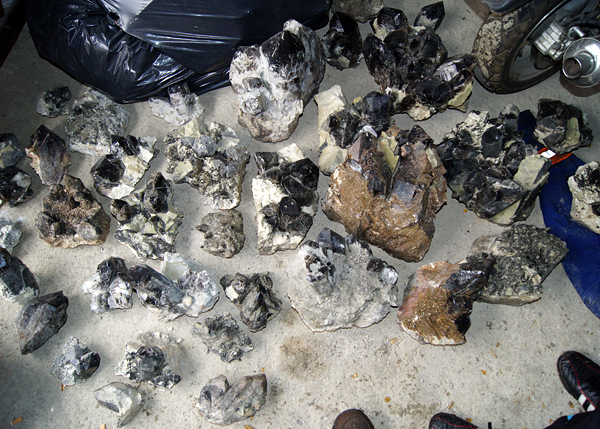 After splitting the big block, pieces of stilbite, feldspar, calcite, pink and violet fluorite, chlorite and smoky quartz up to 10 cm showed up. 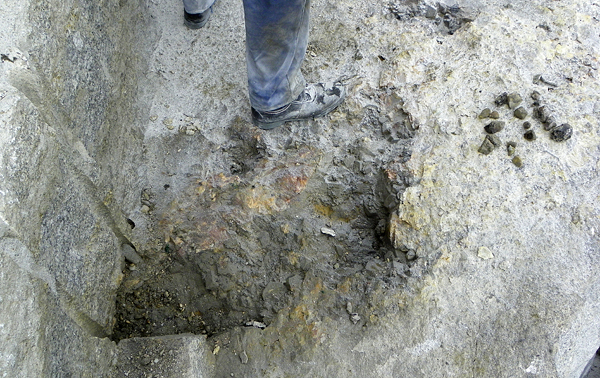 The overall size of the pocket was 80x60x20 cm, which turned out to be the largest cavity in the find. 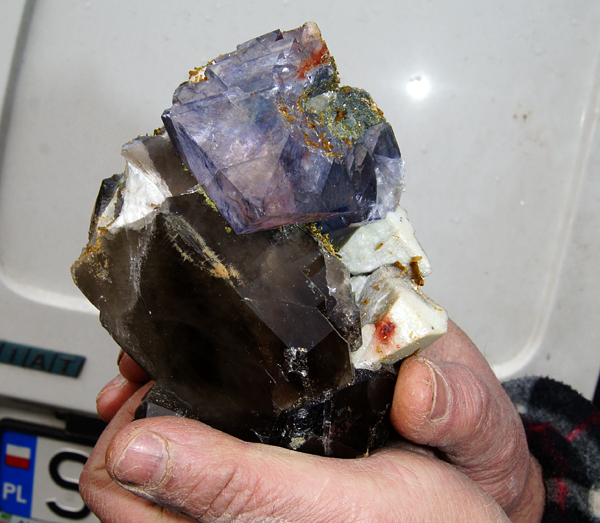 During careful removal of the burnt leftovers, two good quality specimens, including a 4 cm octahedral violet fluorite in association with quartz, calcite and stilbite were recovered. A second cavity was discovered about a week later. 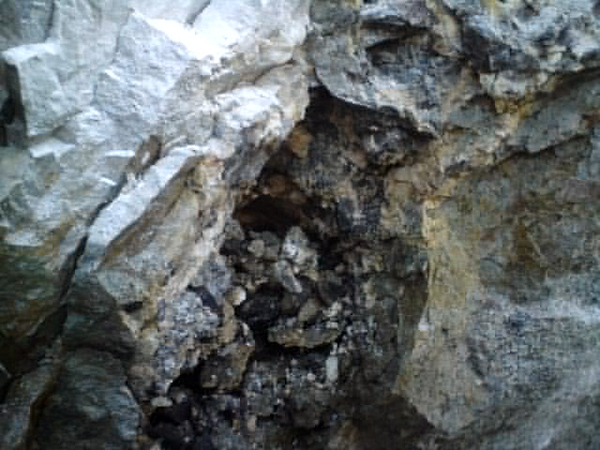 Unfortunately, during opening of this cavity, miners destroyed one nice specimen with feldspars, smoky quartz and fluorite. The pocket was a little smaller than the previous one, about 70x40x30cm, but it produced 6 really good specimens with fluorite on matrix. 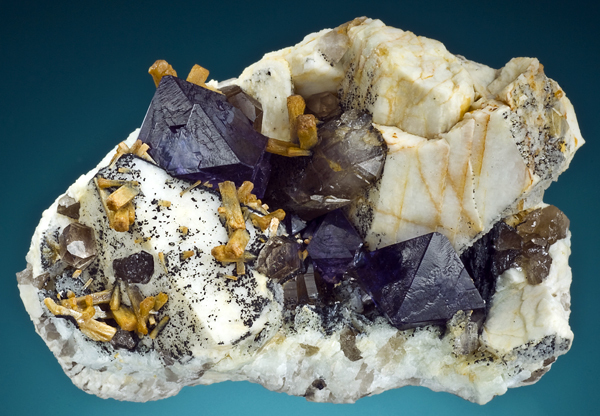 The best of them contained bluish albite, cream color microcline, and a bit of stilbite, with violet fluorites perched on top. The shape of fluorite crystals was distinctive (and rare for Strzegom), resembling “Aztec Pyramids”. 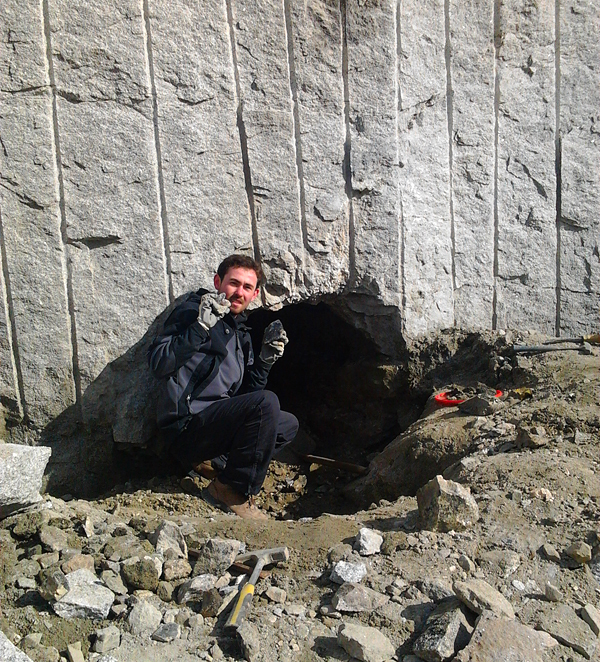 About 30 cm further into the pegmatite another cavity was hit. It was only 20 cm across, and filled with stilbite. It didn’t look very interesting, but after careful examination a very well formed, gem-clear, yellow-greenish beryl crystal with perfect termination was found. 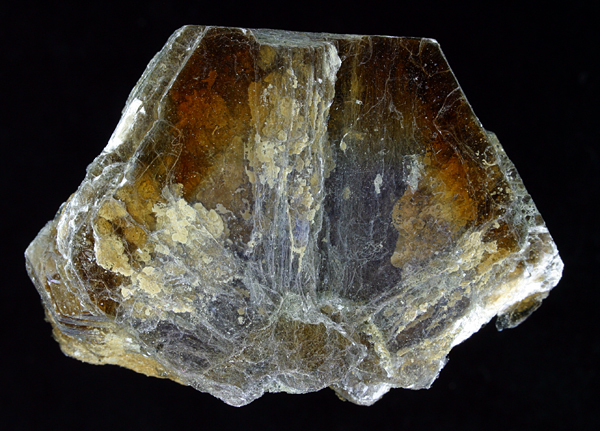 It’s only 2 cm long, but it’s the best heliodor from Strzegom, and from Poland. In subsequent days, three more cavities were opened with sizes from 20 to 40 cm. 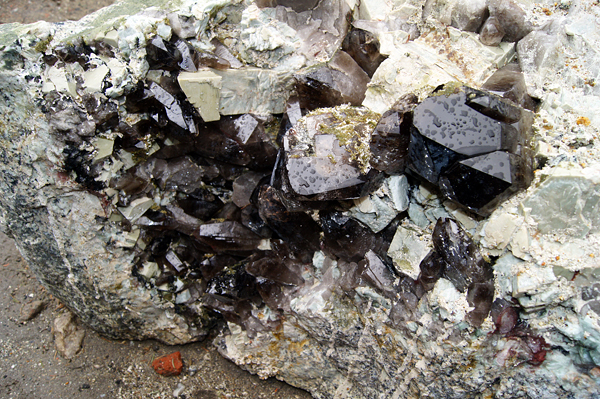 They contained quartz, feldspar, stilbite and fluorite, and produced more good specimens. Overall, 6 cavities were discovered and mined during a 10 day period. In total 11 really good specimens of fluorite and other minerals were collected along with a number of middle quality specimens. 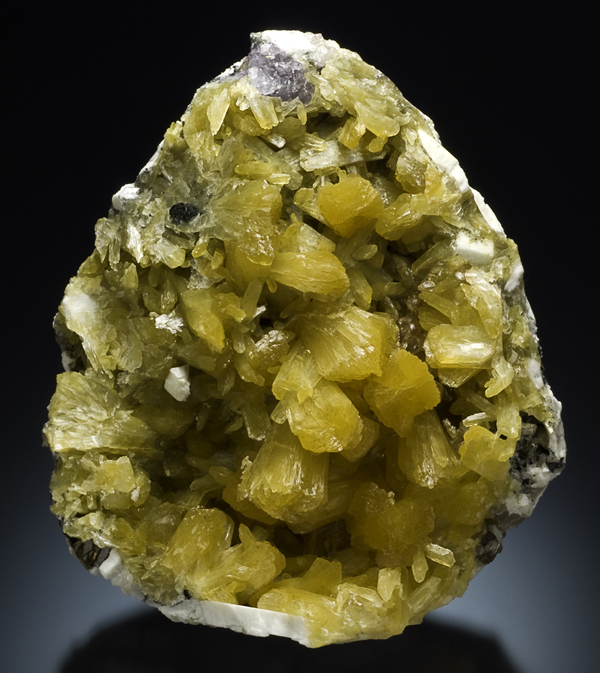 This find was described in detail in MINERALS magazine issue no 2 (see here) and it is known as “Andrzej`s Pocket”. We come back to Wekom II quarry. Google Maps. Miner with freshly opened pocket near his right foot. A. Korzekwa photo. Freshly opened pocket. A. Korzekwa photo. 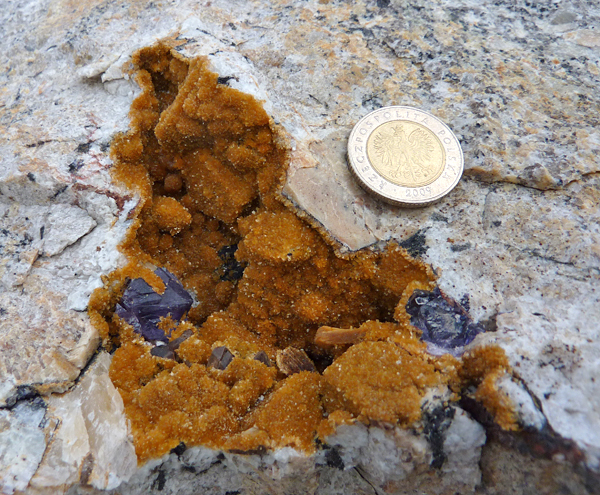 Part of the pocket with violet fluorite and orange stilbite. K. Pietras photo. 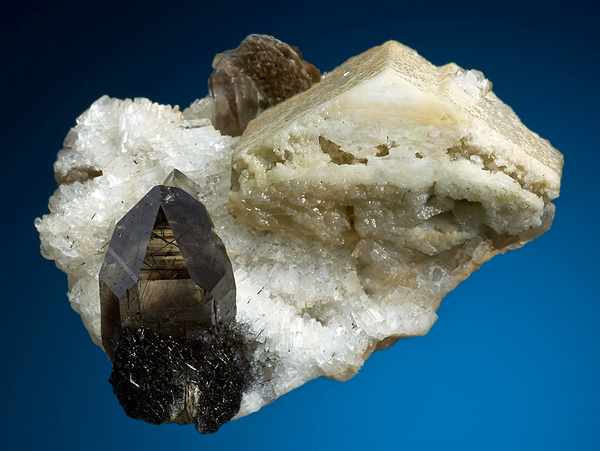 Smoky quartz with microcline and albite from "Andrzej Pocket", 4 cm high. J. Gajowniczek coll. J. Scovil photo. 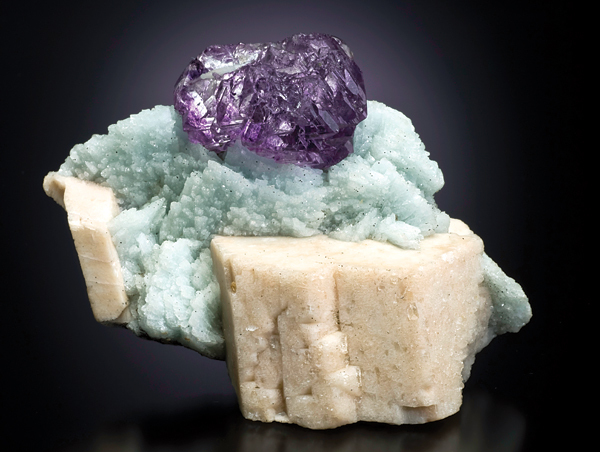 Fluorite with microcline and albite, specimen 12.1 cm wide. Miners Lunchbox coll. J. Scovil photo. 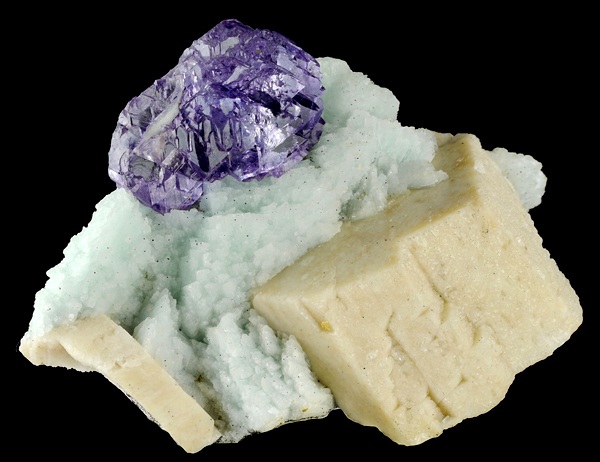 Fluorite with microcline, albite and stilbite, specimen 6.5 cm wide. J. Fisher photo. Fluorite with microcline and albite, specimen 8.2 cm wide. Spirifer coll. J. Scovil photo. Gem heliodore crystal from "Andrzej Pocket", 2 cm high. Spirifer coll. G. Bijak photo. 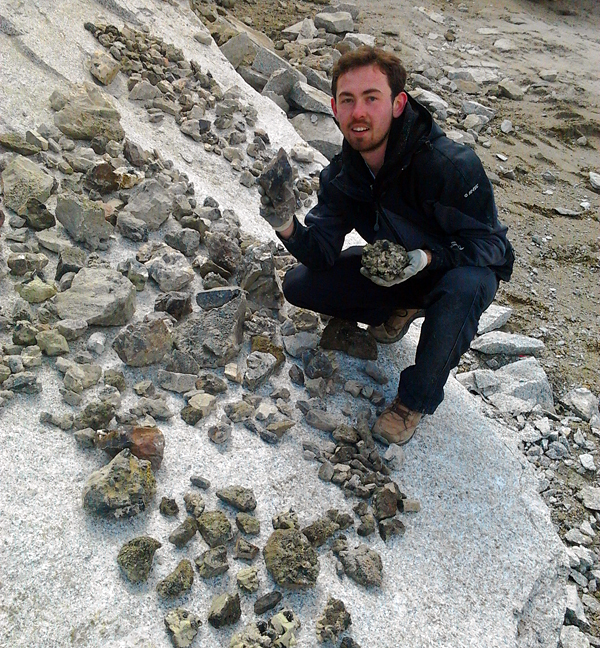 Short movie showing finds in the Wekom II quarry including some fluorites from Andrzej Pocket. 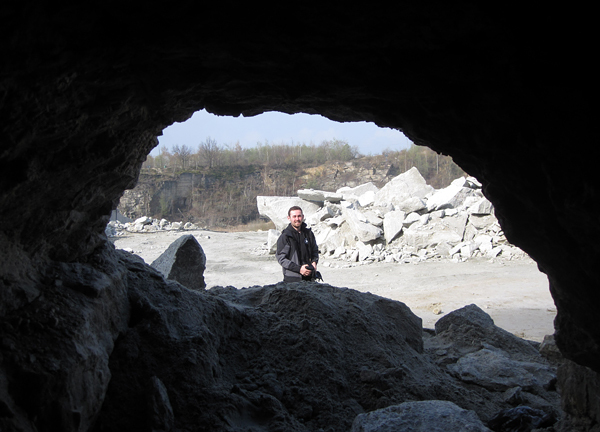 In the “EuroGranit” quarry (a.k.a. 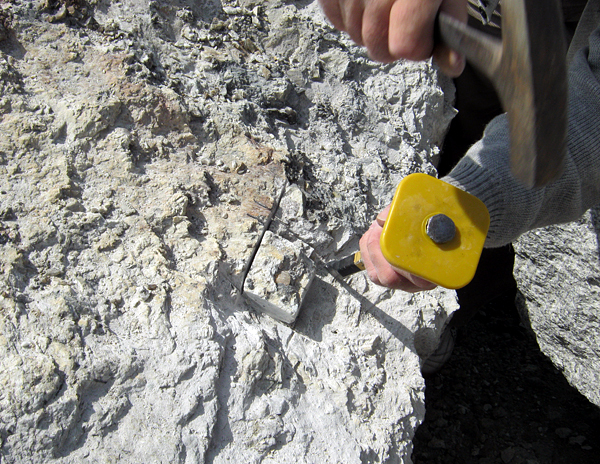 no 0 or Grabina I) during blasting, miners found some space in a pegmatite again. The size of the pocket and exact minerals found inside it are not known. 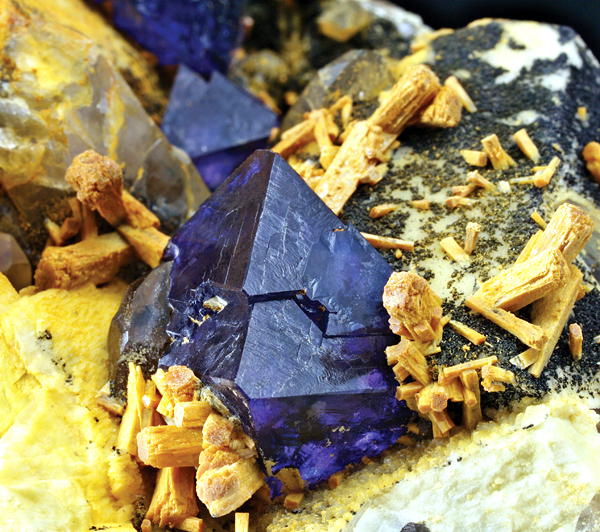 The find was very significant, because it yielded a (single) fluorite specimen of unusual, for Strzegom, quality. 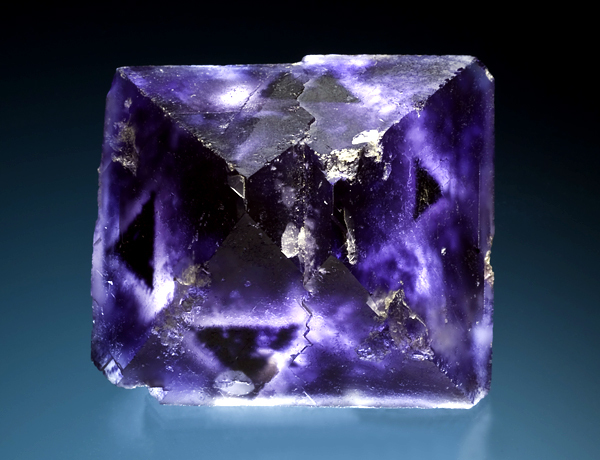 It is 6 cm across and composed of two intergrown fluorite crystals. It shows extreme color zonation with a violet body color and deep purple triangles in the center of each octahedral face. Location of the EuroGranite quarry near Strzegom. Google Maps. 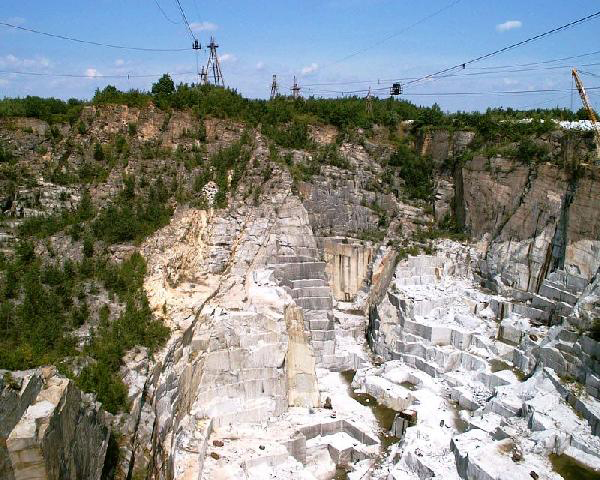 EuroGranite quarry. A. Korzekwa photo. Unique octahedral fluorite with color zoning of each face, crystal 6 cm wide. Spirifer coll. J. Scovil photo. In the B-17 quarry (a.k.a. 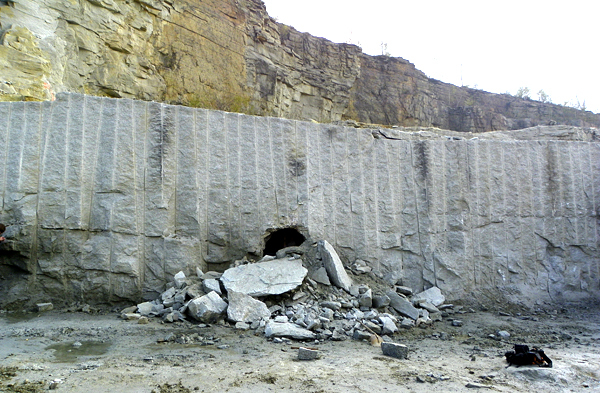 Skalimex) in Borów blasting was carried out at the site of two vertical cracks. Within them a quartz vein, over a dozen cm thick, occurred. During production miners found a zone with a few small pegmatites. Soon, in the same zone, they found a big pegmatite with a void. It’s approximate dimensions were about 1.5x 1.5x2 m. Most of the pocket was filled with a breccia of quartz, feldspar and fluorite crystals, either crushed or still complete. Part of the breccia was made of detached and regenerated druse faces covered with crystals. 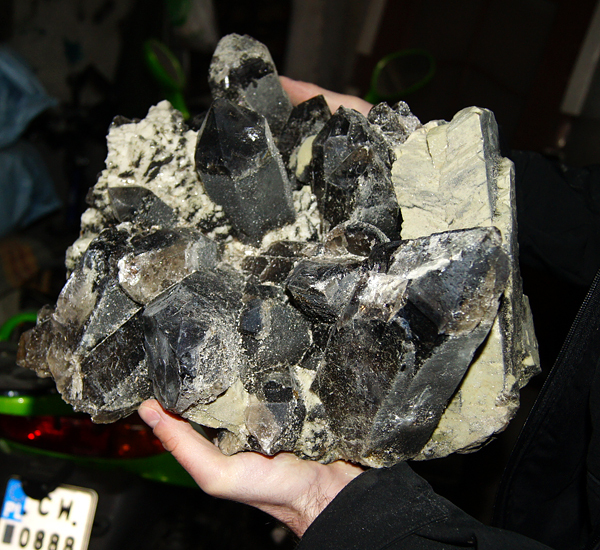 There was also quite a lot of chlorite, covering feldspars and preferentially 2-3 faces of smoky quartz crystals. There was also epidote, as tiny needles, and rarely, single pyrite and titanite crystals, not bigger than 5 mm. 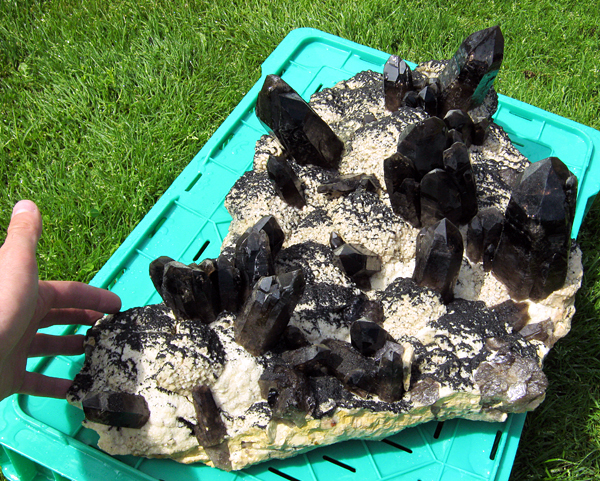 Smoky quartz crystals reached up to 18-20 cm and had numerous phantoms. Feldspar were both microcline and albite. Microcline occurs as small short prisms between quartz crystals, often covering smoky quartz and forming “caps” on it. Snow-white albite filled some spaces between quartz and microcline. During blasting a huge part of the pocket was destroyed. 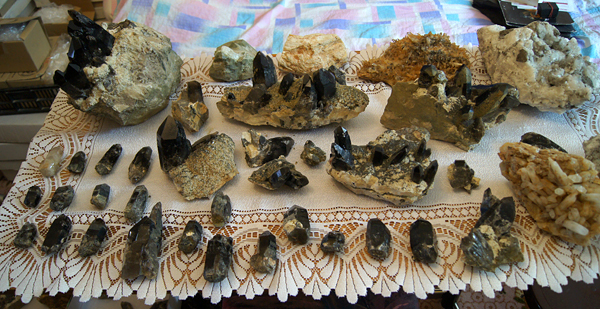 Nonetheless several dozen specimens of really good quality survived, mainly smoky quartz on feldspars. One of them is especially impressive – a 65x40 cm plate of smoky quartz crystals (morion) on feldspar with fluorites (now in Spirifer coll.). This specimen is the best of the classic combination of morion with feldspar known from the Strzegom area. 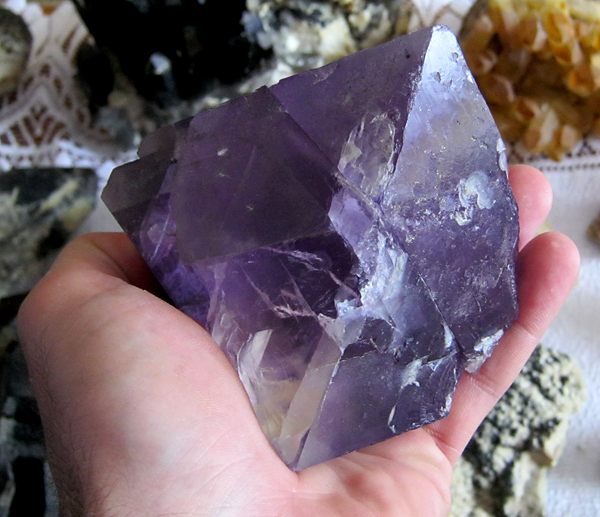 In this find there were also two big octahedral fluorite crystals found, their dimensions are 10x9x5 cm and 6x6x5 cm. Unfortunately, the bigger one was crushed by careless miners, and then repaired from 3 pieces. 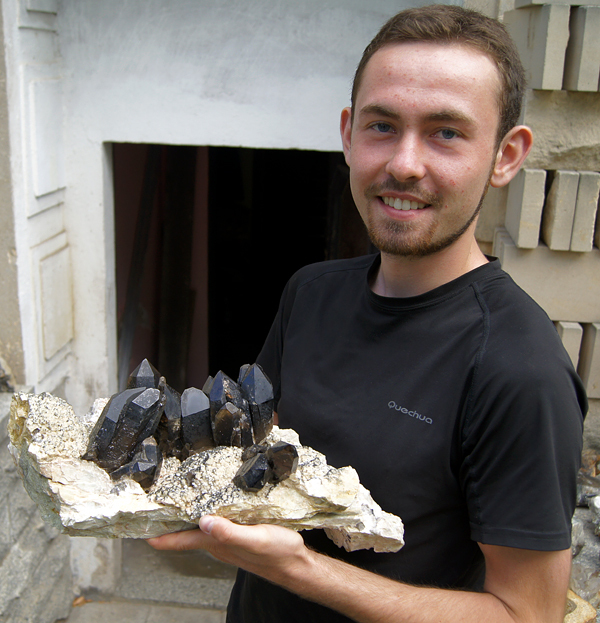 In terms of size and quality of specimens, this find was one of the most significant in the history of Strzegom-Sobotka massif. 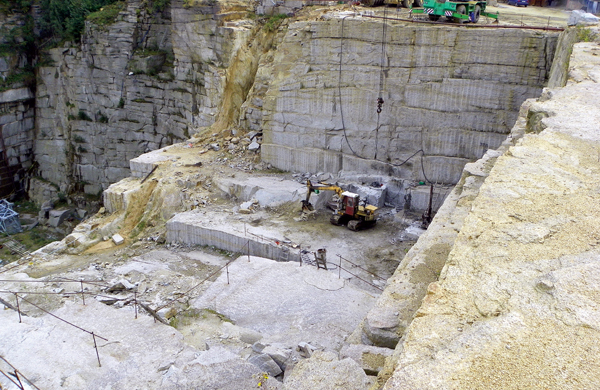 An interesting fact is that it was the first such big find in this quarry in over a decade. 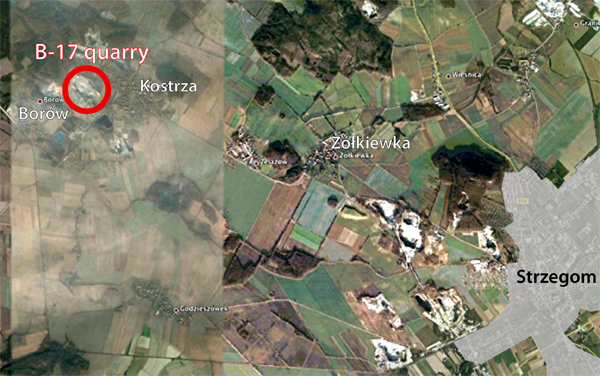 Location of B-17 quarry in Borów. Google Maps. B-17 quarry. T. Praszkier photo. The only existing photo fo the pocket. Anonymus miner`s mobile phone photo. Some of specimens produced from the pocket. A. Korzekwa photo. Smoky quartz on white albite. A. Korzekwa photo. 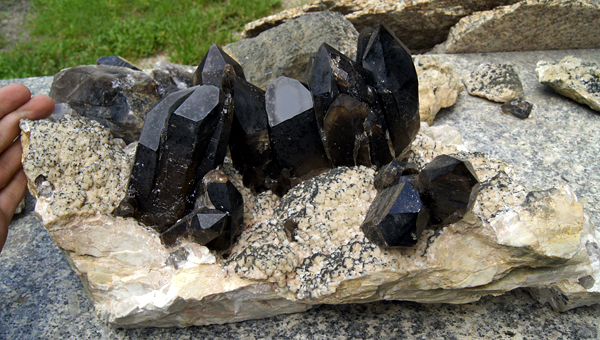 Group of smoky quartz crystals. A. Korzekwa photo. 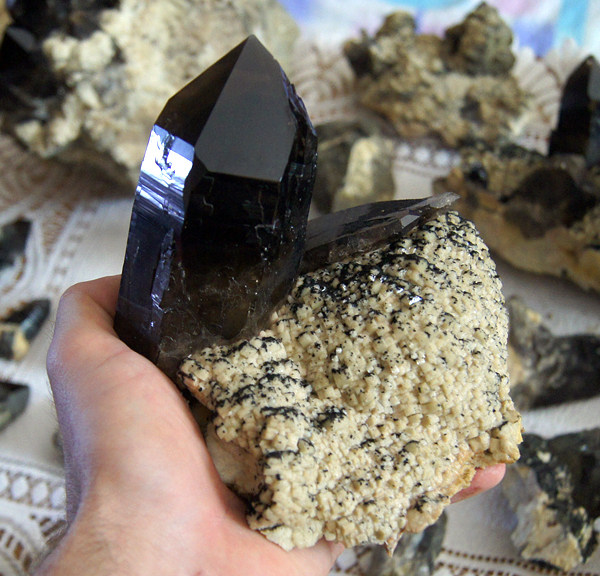 Big specimen of smoky quartz crystals with feldspar. A. Korzekwa photo. 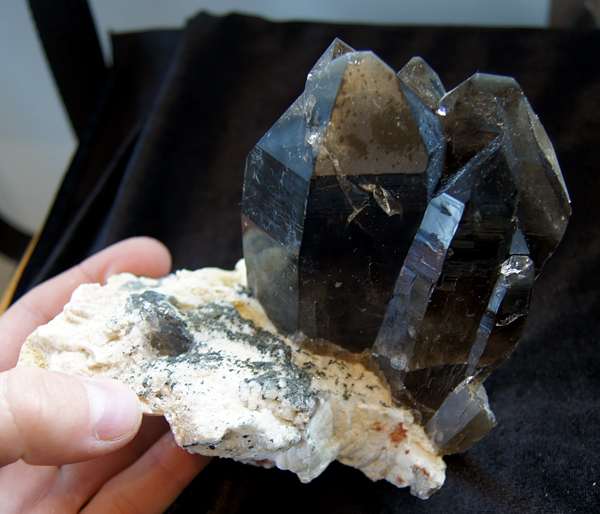 The same specimen of smoky quartz crystals with feldspar. M. Korzekwa photo. The best plate from the find and the best specimen of smoky quartz with feldspar known from Strzegom. Spirifer coll. A. Korzekwa photo. 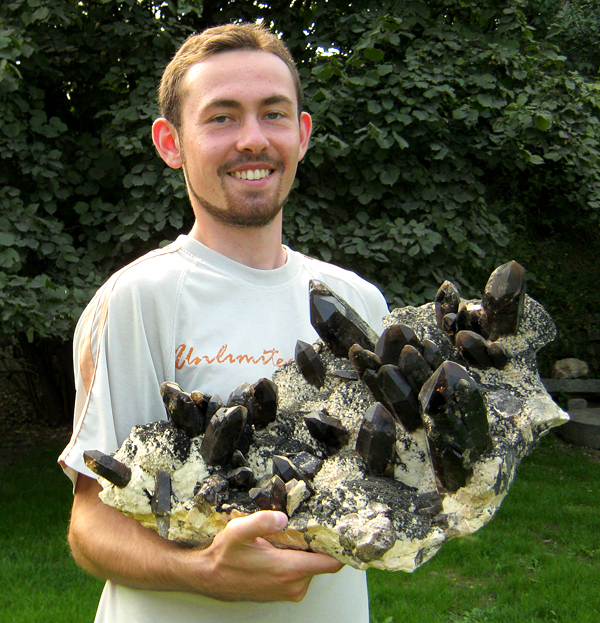 Author (AK) with "creme de la creme" of the find, the same specimen as ilustrated above. T. Korzekwa photo. 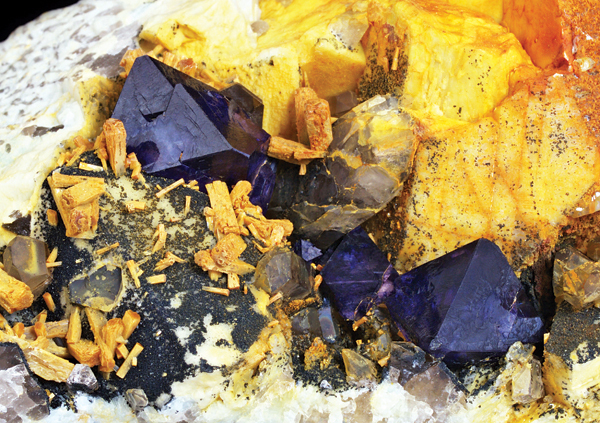 Close-up of the specimen showing 2 cm big fluorite crystal. A. Korzekwa photo. Fluorite octahedron from the same find. A. Korzekwa photo. 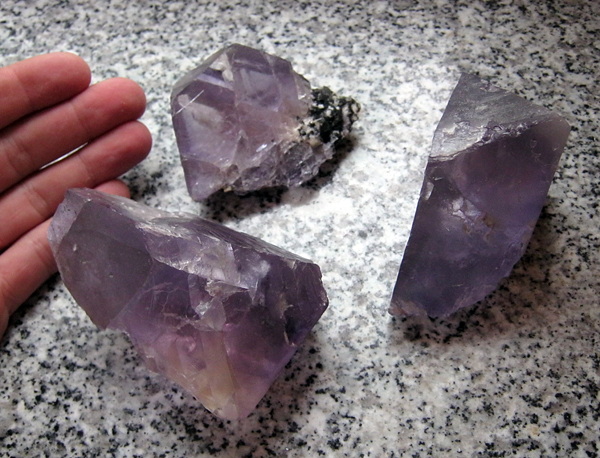 The biggest fluorite crystal from the pocket was broken in 3 pieces. A. Korzekwa photo. Specimen ilustrated above, here already repaired. A. Korzekwa photo. The same repaired big crystal. A. Korzekwa photo. Exploitation in B-17 quarry (Skalimex) was continued in the same zone. One operational level lower Than the previous find, miners encountered a second pocket. This time a bit smaller – about 1.2x1x1 m. During excavation the druse was divided into two parts, one stayed in place, while the other one was part of a big block that was separated from the wall. Just a small part of this pocket was filled with breccia, the majority of crystals grew from a solid pegmatite in granite without any cracks. 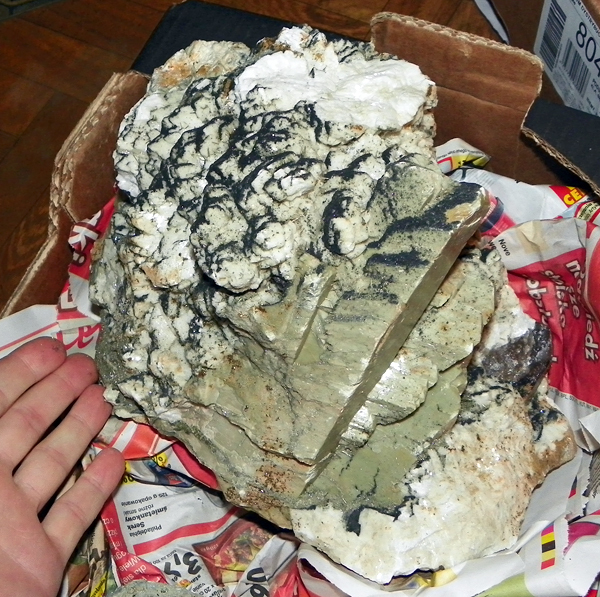 Miners started crushing the block to get specimens. Unfortunately, extraction with crowbars and hammers ended up destroying a number of the specimens. Fortunately, the foreman, who was on site that day, realized that there was no possibility of extracting specimens, so it was finally removed in two pieces, weighing 1.5 t each. Then, in processing plant, workers cut two parts of the druse from the blocks, each fragment about 300 kg. After that both parts of it were re-attached and half of the pocket reconstructed. Today it stays in Spirifer collection. The total weight of it after all the trimming work is around 400 kg. 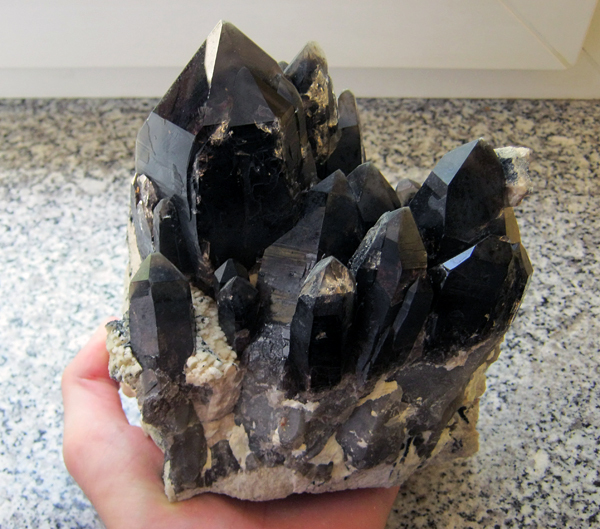 The cavity is covered with very lustrous smoky quartz crystals, up to 15 cm. 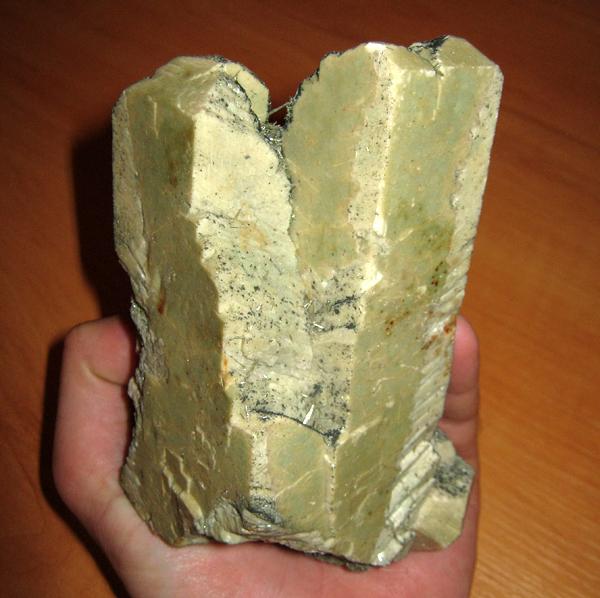 Microcline occurres as both short and long prisms; the long ones are often in the form of baveno twins up to 20 cm long. 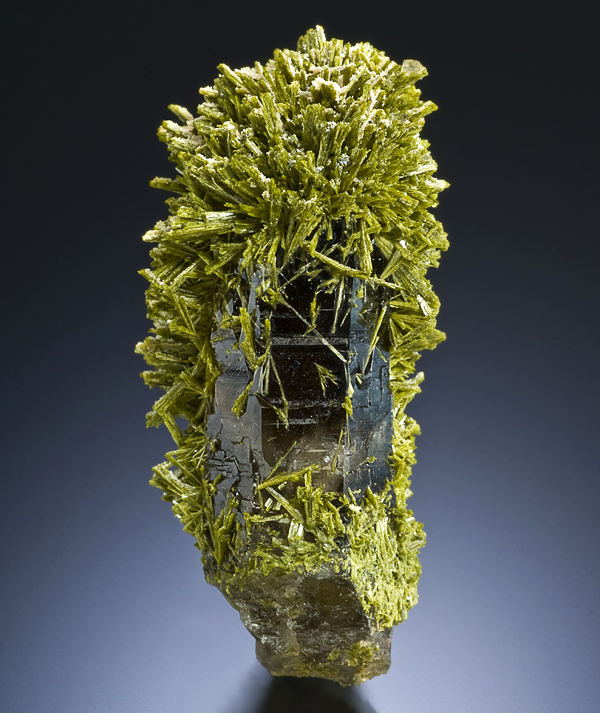 The pocket also contains crystals of pericline, epidote, stilbite, pyrite, chalcopyrite, fluorite and coatings of a mixture of chlorite, montmorillonite and hematite. 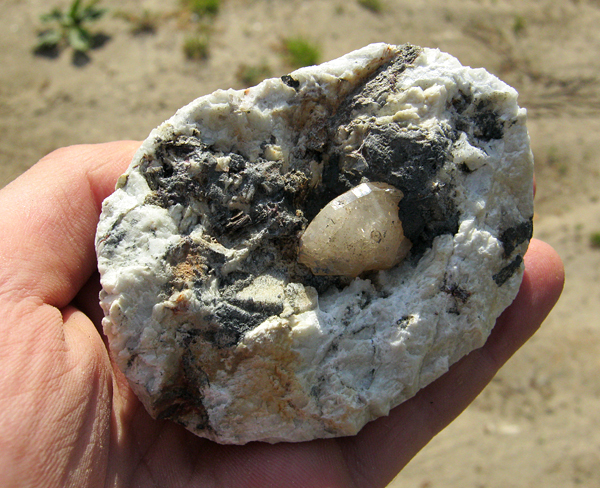 This find was unique because it was the first time in Strzegom-Sobótka massif when an almost complete pocket of such a big size was extracted, with complete, undamaged crystals. These two finds aroused considerable interest of miners in the B-17 quarry, who had previously no contact with such material. Mining is still carried out in that zone, so let’s hope that there will be future interesting finds there. Andrzej examining part of the huge pocket, note the second half in the background. M. Korzekwa photo. About 1 m wide half of the pocket. A. Korzekwa photo. Cose-up of the same specimen. A. Korzekwa photo. Second half of the pocket. A. Korzekwa photo. 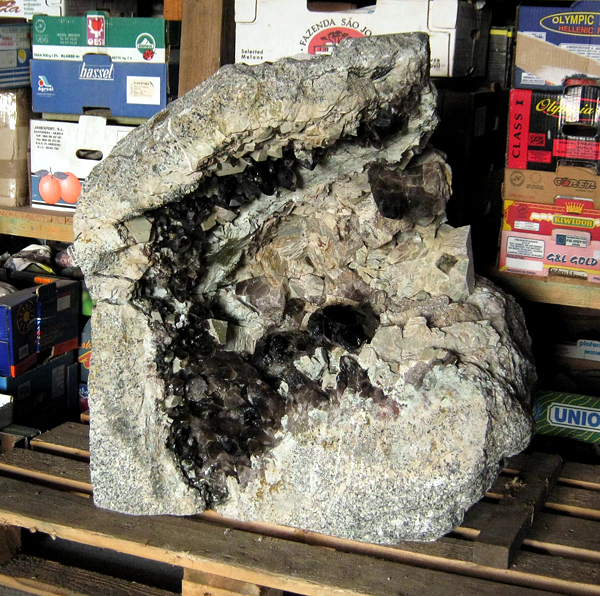 About 500 kg specimen after mounting bothhalves together, specimen still needs reconstructions, many single crystals have to be re-attached (see photos below). Spirifer coll. A. Korzekwa photo. Morion crystal which will be re-attached to the big specimen. A. Korzekwa photo. Big microcline crystal which will be re-attached to the big specimen. A. Korzekwa photo. Huge microcline crystal which will be re-attached to the big specimen. A. Korzekwa photo. 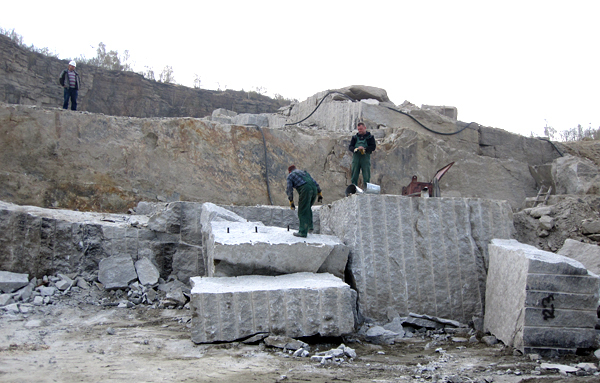 After blasting in the “Źółkiewka I” quarry miners started splitting a big rock block into smaller pieces. Just after the blast some of them saw a fragment of a pegmatite in a crack created because of the explosion, but no one realized the scale of the discovery. 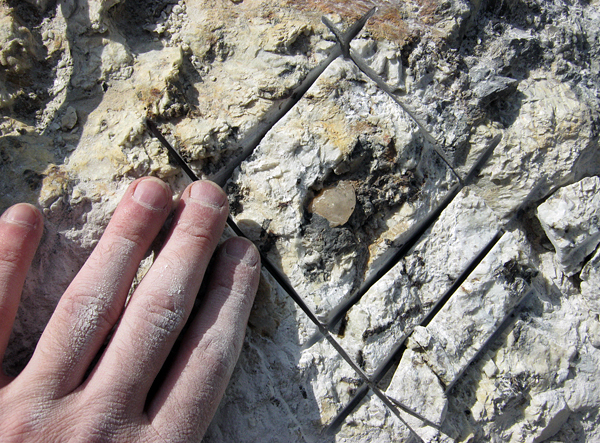 After a day of work, and dividing the block into few pieces, part of the pegmatite was revealed. Suddenly, one of the workers disappeared, and the rest were shocked when they saw him emerging from the slot between the pegmatite in the wall and the huge block, with crystals of smoky quartz; couple of dozen cm in length. 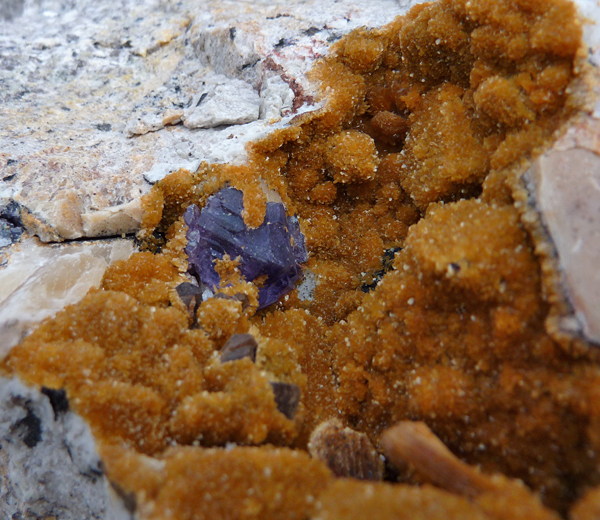 It turned out that the block was covering up the entrance to a huge cave in the pegmatite, filled with crystals. 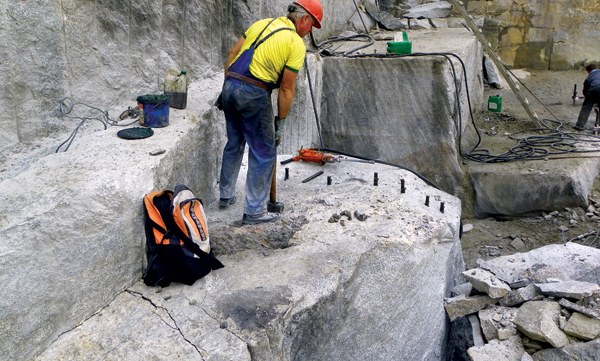 Miners moved blocks of rock to get specimens. The cavity was really vast. Its dimensions were around 1.5 m heigh, 2.5 m deep and 1.8 m wide. The diameter of the entrance was about 90 cm. 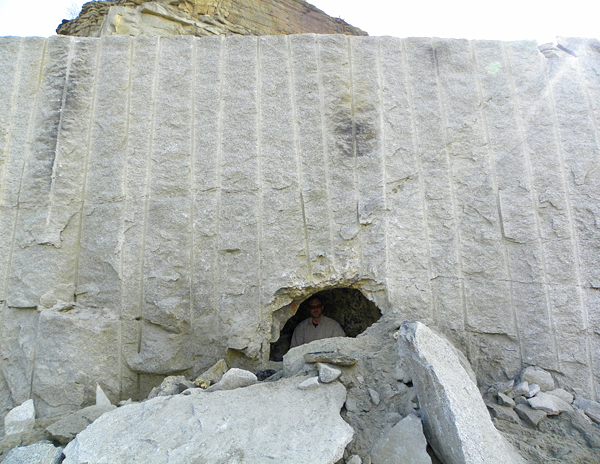 The entrance was later expanded by collectors and geologists visiting the quarry, to slightly over 1 m. Thanks to that it was possible to take some unique photos of the cavity. 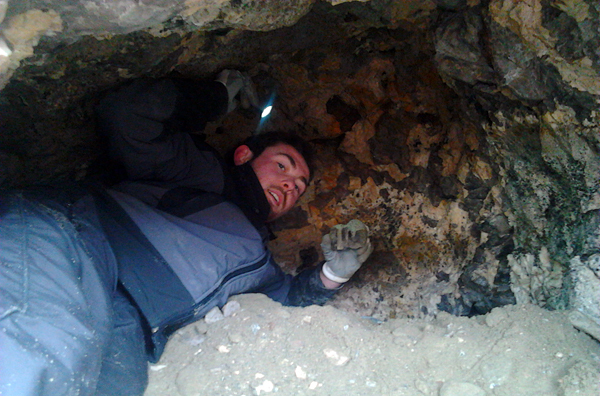 In the cavity, there were mainly smoky quartz and feldspar crystals, but also many more interesting minerals. After exploring 2/3 of the chamber, a breccia was found that was composed of quartz and feldspar in crushed irregular pieces of crystals, and fragments of chamber’s walls, that had detached and were cemented together by later mineral growth. 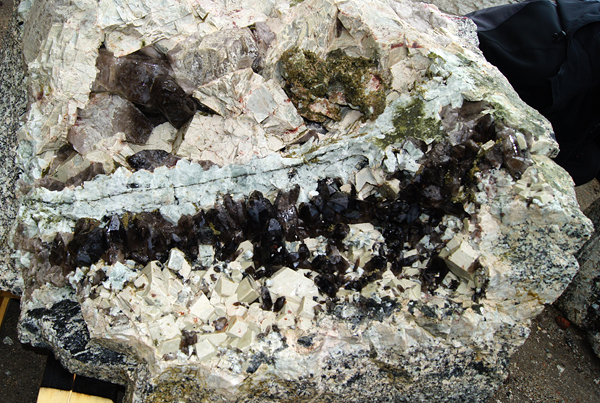 The breccia was bonded with epidote and huge amounts of chlorite. On the faces of the chamber crystals were in place only on the ceiling and on part of the floor. 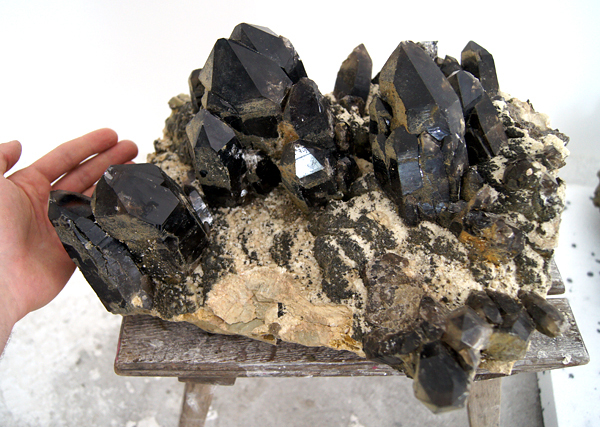 Smoky quartz formed crystals, up to 30 cm long, growing on feldspar, forming crystal clusters and single regenerated crystals. 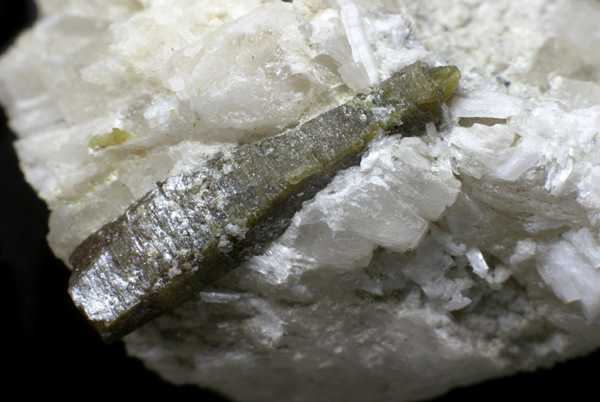 On one side crystals were preferentially covered with chlorite and epidote, so only 2-3 faces were lustrous. 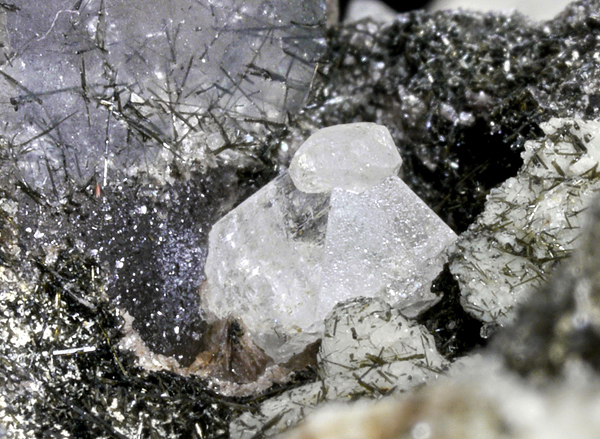 Quartz crystallized in 3 generations – a typical sequence for Strzegom pegmatites. 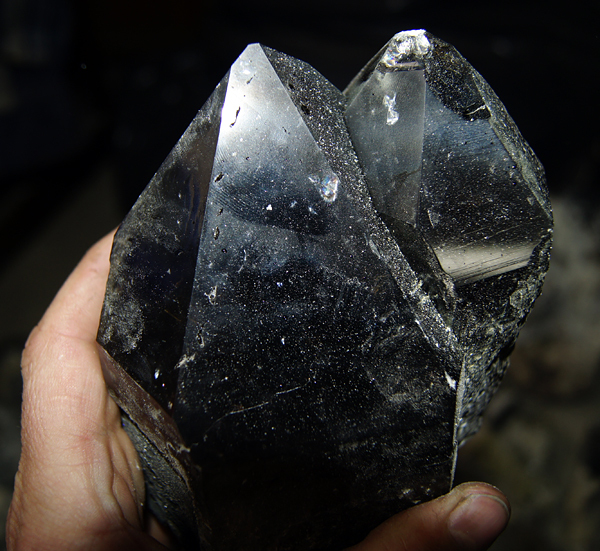 First, as grey quartz, without any automorphic crystals, always overgrown by younger generations. 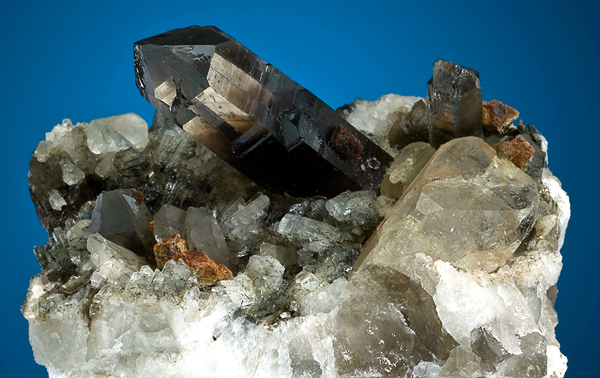 The second generation was smoky quartz, often covered with chlorite and epidote, usually with dull faces. 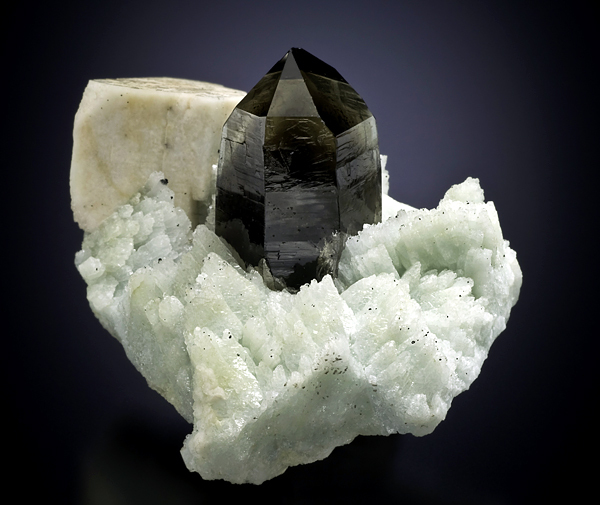 The last generation was slightly smoky, or colorless quartz, with numerous epidote and chlorite inclusions. 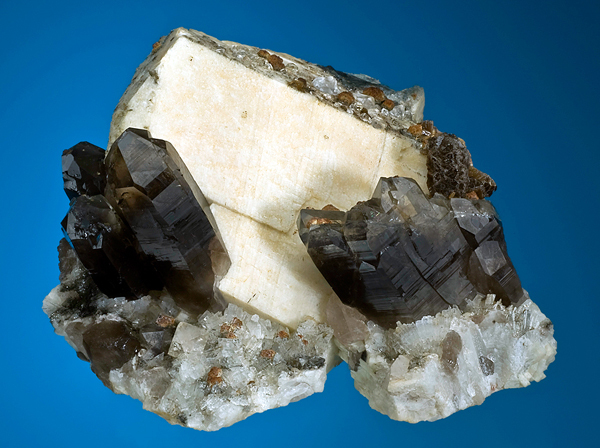 Crystals were sometimes covered with stilbite and red hematite coating. The biggest specimens were recovered from the ceiling of the cavity. Microcline is found in two habits, short and long prisms. Long ones formed mainly on the ceiling and in breccia as regenerated single crystals and growths. They formed mainly as baveno twins, rarely as polysynthetic twins. Almost all had one face covered with chlorite and epidote, as quartz crystals. They were up to 30-35 cm long, which is quite big for Strzegom. 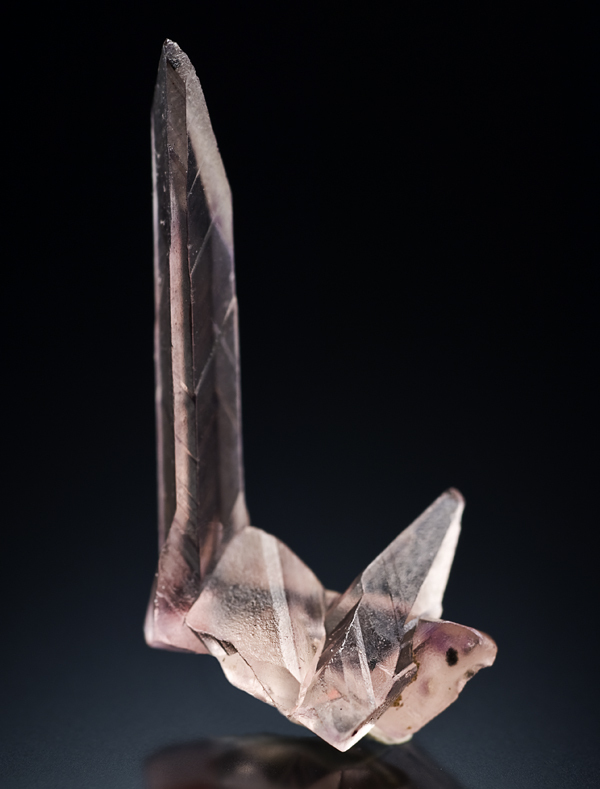 The second morphotype, short stakes, formed in the lower part of the pocket, filling spaces between crystals of with quartz and snow-white pericline. Sometimes they are found as manebach twins, with a perthitic texture and epitaxial growths with albite. 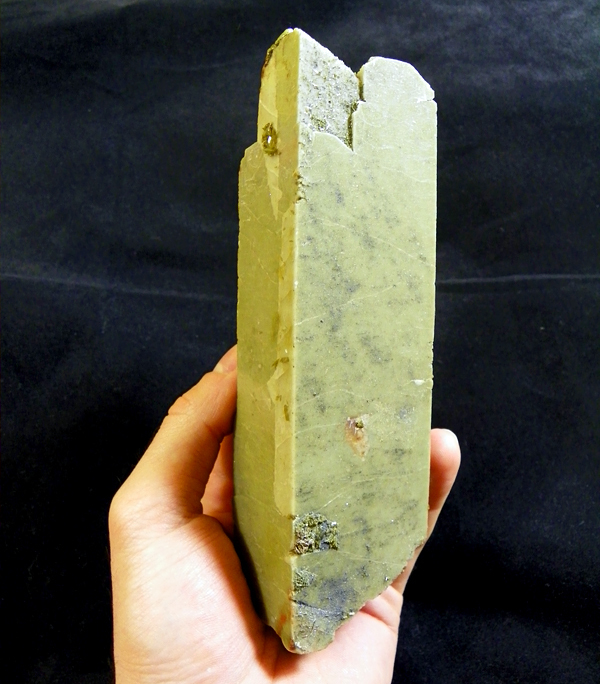 Both morphotypes of microcline are dark green, probably because of addition of iron. 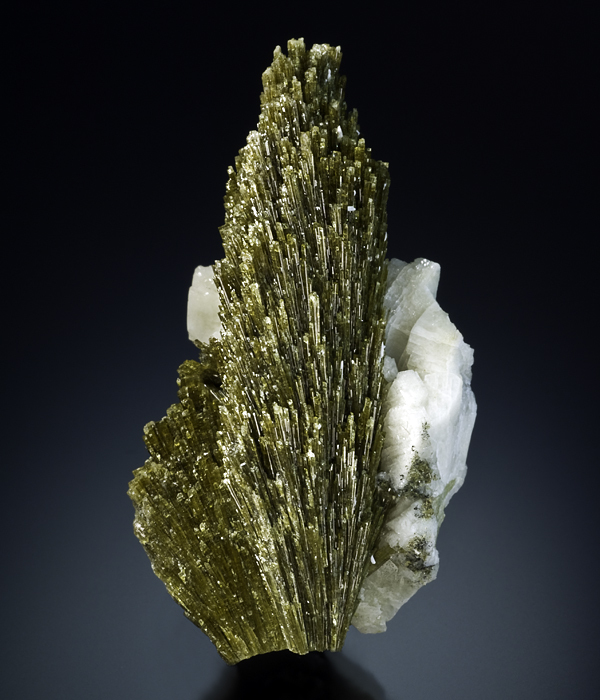 Other common minerals are chlorite and epidote, occurring in almost all parts of the cavity. All of these quartz and feldspar crystals wouldn’t be worth mentioning if not their size (they were big but ugly) and the size of the pocket. 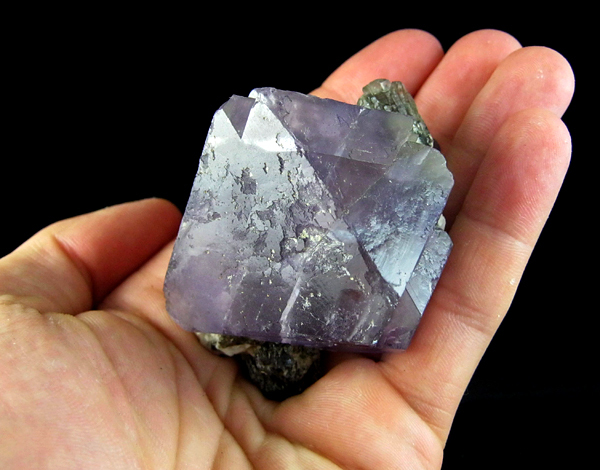 The mineral that makes this find more significant is fluorite. Although there are not many fluorite crystals, and they are not particularly big, one specimen was really amazing and world class. Information about the druse got to the authors the day after its discovery; It was brief: “big hole, hundreds of specimens, huge crystals, come, our garage is full of them”. After visiting the garage of one of the workers, it was possible to confirm the news. Indeed, there was a lot of specimens, but the quality was low. There were huge growths and plates of pegmatite with quartz and feldspar crystals, but most of them were seriously damaged, and even if they had not been damaged they were dull and ugly. Workers were shocked by the size of the pocket, so they took just the biggest specimens, extracting with crowbars everything they could. The biggest specimen, extracted from the ceiling fell to the unprotected floor of the pocket, so it didn’t look too spectacular. Just after getting to the quarry, we noticed a piece of the excavated block and hundreds of crushed and scattered crystals were visible. The wall had been covered with a small pile of earth. 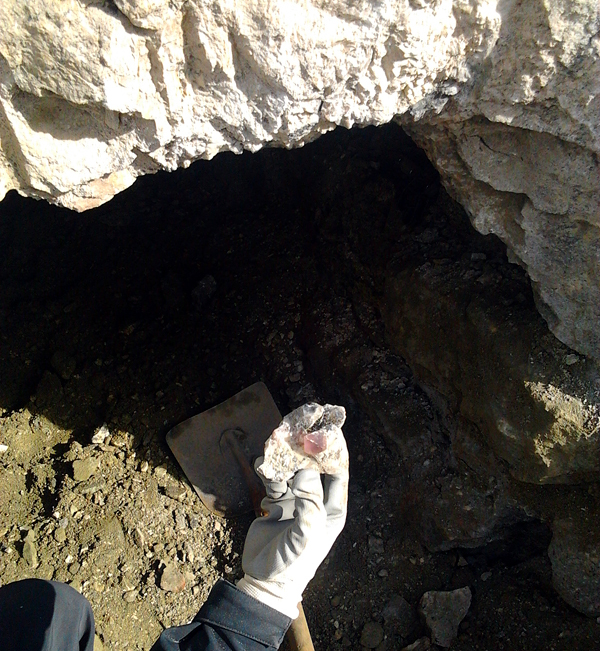 We started digging in the pile and finding more and more quartz and feldspar crystals, finally the huge chamber in a granite wall appeared. 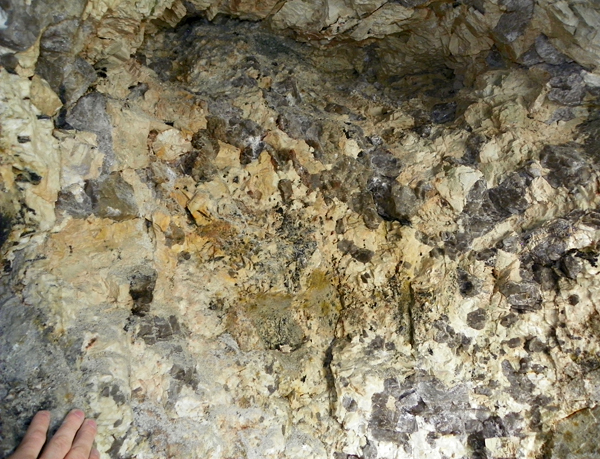 It turned out that the workers, taking only the biggest specimens, left the breccia almost untouched, and in this breccia is where fluorite specimens were found. First, a 3 cm crystal of pink (sic!) 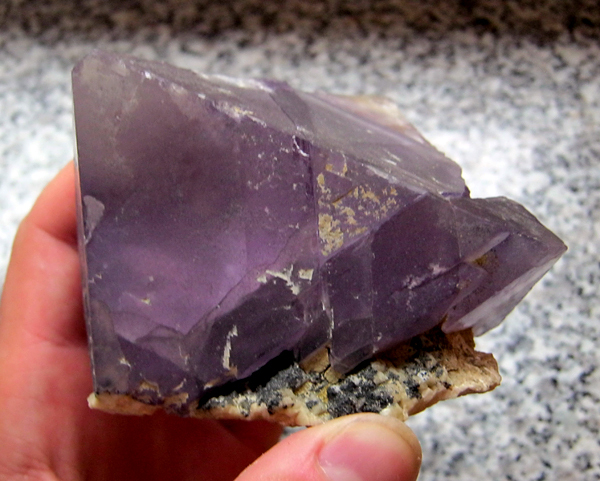 fluorite fell from between quartz crystals. 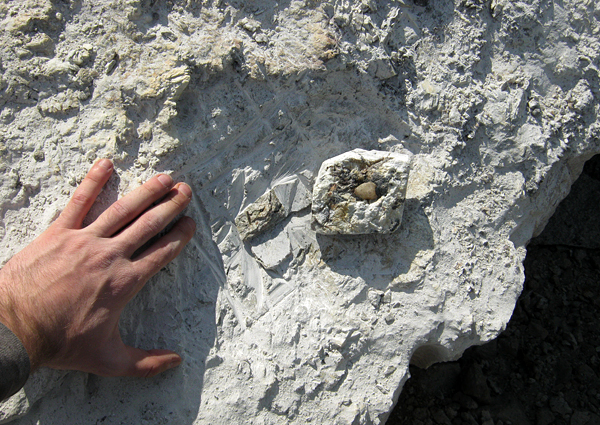 About 0.5 m further we found a regenerated plate made of feldspar with quartz that had a small single fluorite crystal and a place where the pink crystal, found earlier, perfectly fit. 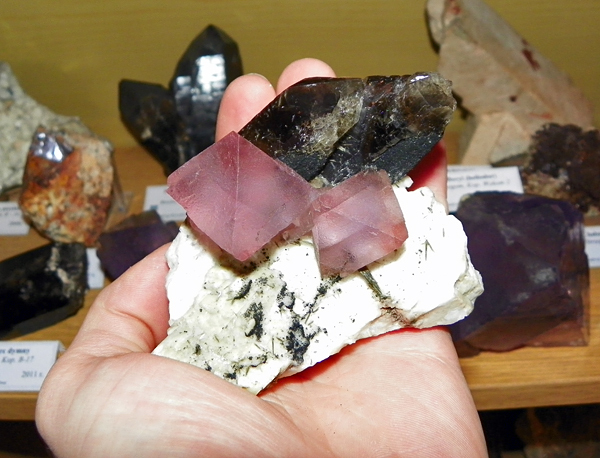 Luckily one of the best pink fluorite specimens from Strzegom-Sobotka massif was completed and repaired. This pocket was described in Lapis magazine (see here) and it was named “The Four Man Pocket” because 4 people could enter there at once! In our opinion “The Pink Fluorite Pocket” would be a more appropriate name. Location of Źółkiewka I quarry near Strzegom. Google Maps. Źółkiewka I quarry. A. Korzekwa photo. Specimens in the miners` garrage. A. Korzekwa photo. 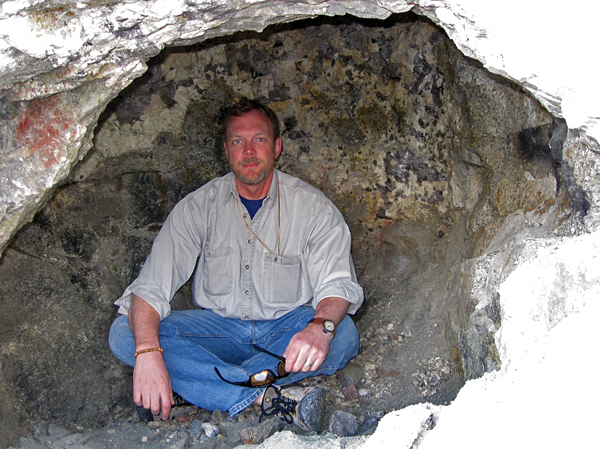 Author (AK) with one of the big specimens extracted by the miners. M. Korzekwa photo. Another big specimen. M. Korzekwa photo. Feldspar from the find. A. Korzekwa photo. Feldspars from the find. A. Korzekwa photo. Miners told us that they cleaned completely the pocket, but we went there another day in the morning... A. Korzekwa photo. When we examined the pocket it showed up ... D. Libelt photo. ... that there is still a lot to collect. D. Libelt photo. Author (AK) with friends with freshly collected specimens. B. Świderski photo. Are you really sure that pocket was completely cleaned? D. Libelt photo. And here it is - the best specimen from the find left by the miners! D. Libelt photo. 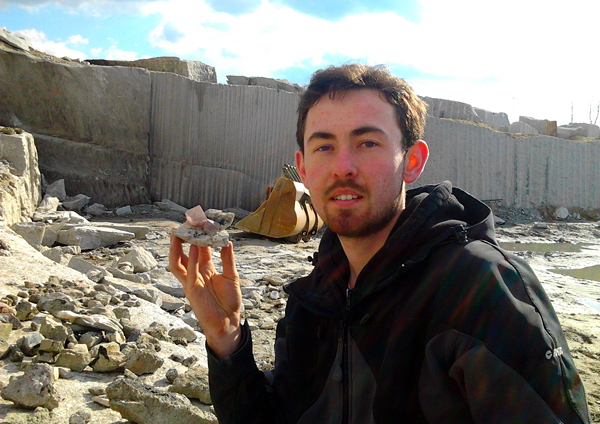 Happy Andrzej with pink fluorite specimen. D. Libelt photo. The same specimen after cleaning and repairing. A. Korzekwa photo. The same specimen. Spirifer coll. M. Mauthner photo. The same pocket during another visit a few weeks later. A. Korzekwa photo. John Rakovan in the pocket. A. Korzekwa photo. John Rakovan meditating in the pocket. A. Korzekwa photo. View from the inside. J. Rakovan photo. Walls of the pocket cleaned from crystals. A. Korzekwa photo. 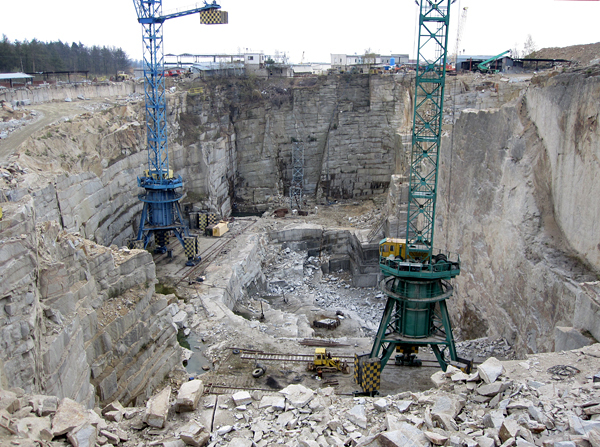 In the “EuroGranit” quarry blasting took place in the area of a new excavation in the SE part of the quarry. In this area there’s a fault zone cut by quartz veins that is rich in pegmatites. During work miners found a small, about 1 m, cavity. Although it was small and located in upper zone of the massif, where most of pegmatites are weathered, it yielded really good quality specimens. 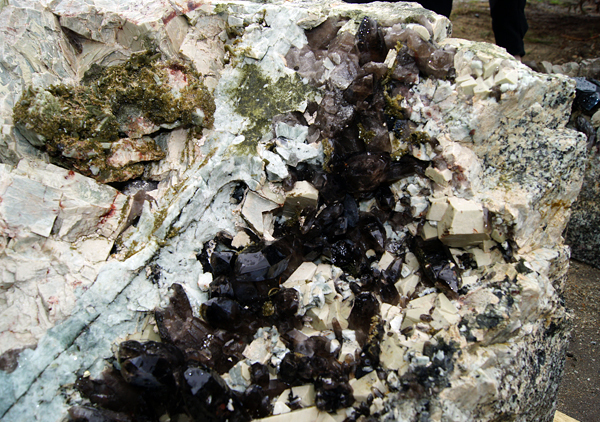 There were very lustrous quartz crystals, up to 10-15 cm, sitting on feldspars with dark green epidote, stilbite, and high quality fluorite crystals. 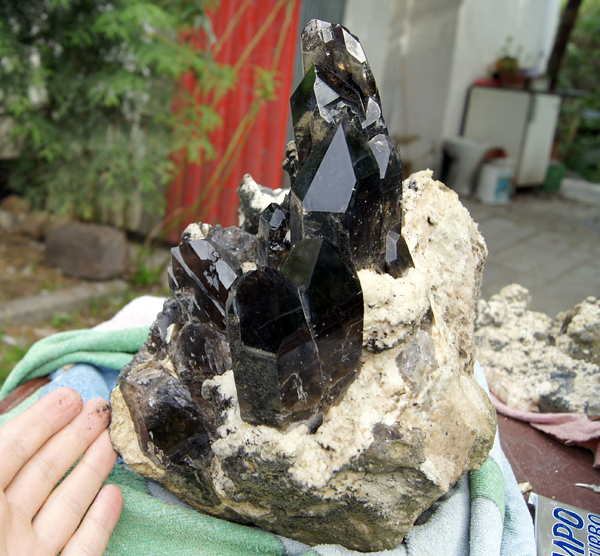 This find brought several Strzegom specimens of a really good quality, for example smoky quartz crystal cluster, with crystals over a dozen cm long, very lustrous, and about 10 cm long smoky quartz specimen with about 5 cm fluorite crystal in it. Location of EuroGranite quarry. Google Maps. 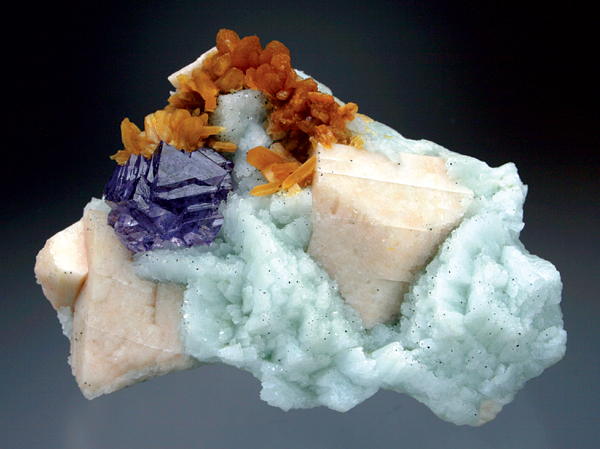 Fluorite on albite with small stilbite crystals. K. Dembicz coll. A. Korzekwa photo. The same specimen with bottle of vodka as a scale ;-) A. Korzekwa photo. Unique specimen of big fluorite crystal on smoky quartz from the find. M. Oleszczuk coll. A. Korzekwa photo. 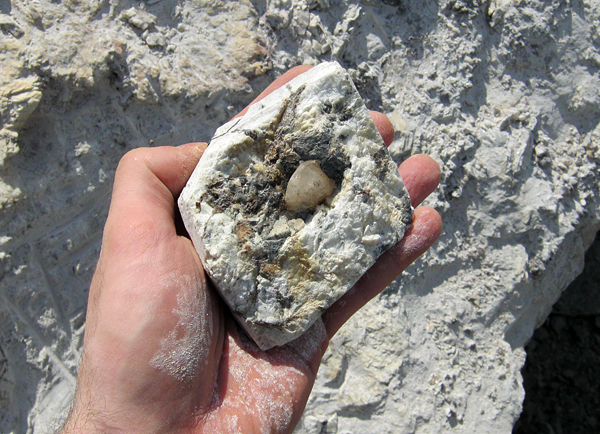 There was a small find in a pegmatite vein containing small pockets in the Zimnik quarry in May 2012. 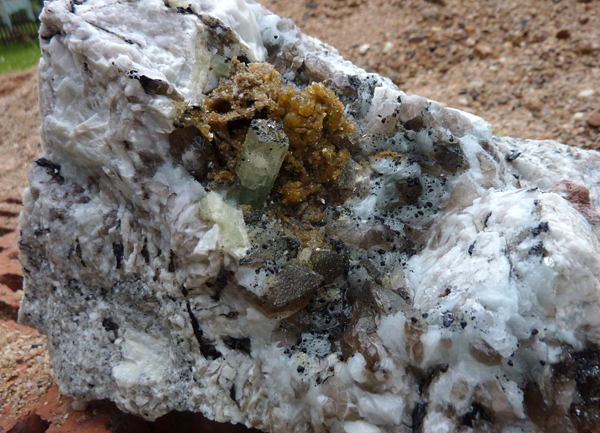 The majority of the pockets was full of laumontite (which is very distinctive for this quarry), but one of them contained stilbite and well-formed gem aquamarine crystals up to about 3 cm! The cavity was extracted and it is still waiting to be cleaned and trimmed, but it looks like these crystals might be the best aquamarines found in Strzegom area. 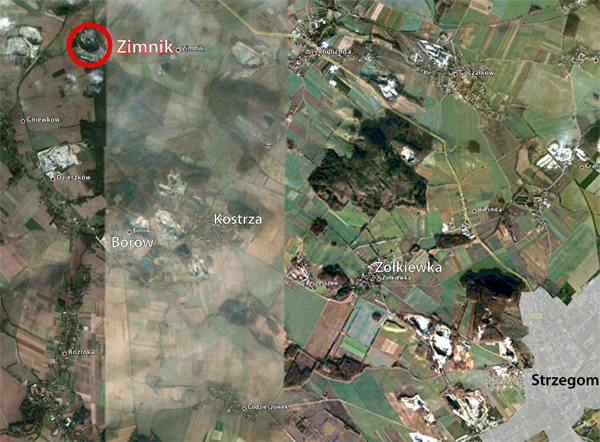 Location of the quarry in Zimnik. Google Maps. Zimnik quarry. A. Korzekwa photo. 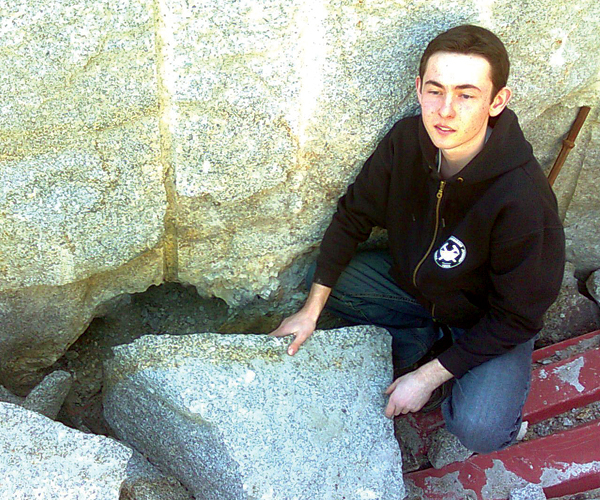 Granite blocks with small pockets. K. Pietras photo. Pocket with stilbite and aquamarine crystal about 3 cm high. Spirifer coll. K. Pietras photo. Below we would like to share a few photos from small finds which do not have great importance for Strzegom area but produced some nice specimens. 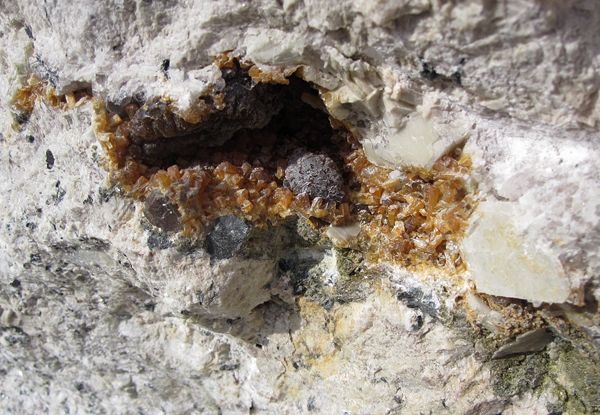 Pocket in situ with big stilbite crystals, Źółkiewka I quarry. A. Korzekwa photo. 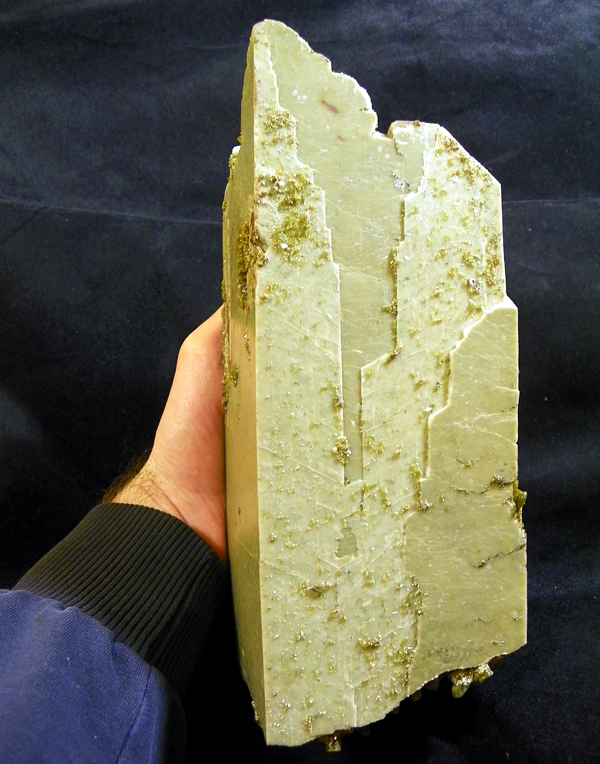 Aesthetic specimen of quartz with epidote, specimen 5.9 cm high, from EuroGranite quarry. Spirifer coll. J. Scovil photo. Group of epidote crystals with feldspars, specimen 4.3 cm high. Spirifer coll. J. Scovil photo. Pinkish microcline with epitaxial white albite, specimen 12 cm high. Spirifer coll. J. Scovil photo. 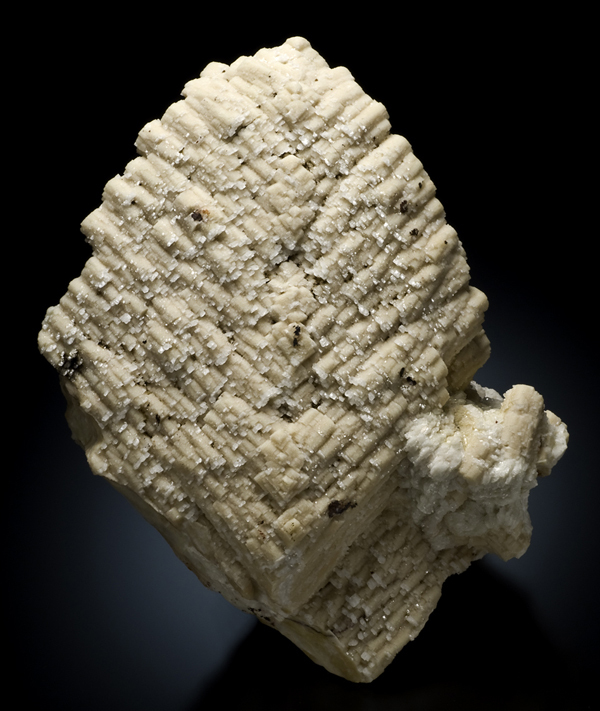 Stilbite specimen, 10.3 cm high. Spirifer coll. J. Scovil photo. 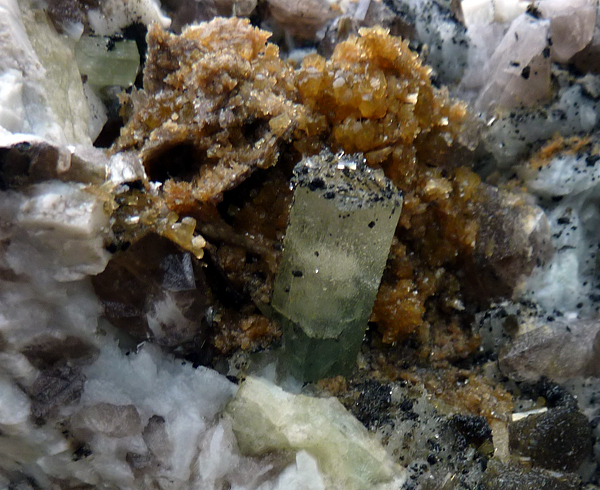 1 cm long crystal built by parisite+synchysite+rontgenite-(Ce) from Zimnik. E. Szełęg collection and photo. Unique specimen of twinned and extremely distorted floater of fluorite 2.5 cm high, from Źółkiewka I quarry. Spirifer coll. J. Scovil photo. 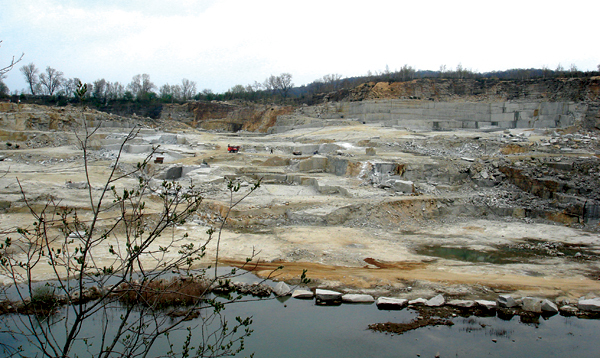 As mentioned before, production in the Strzegom quarries have recently slowed. 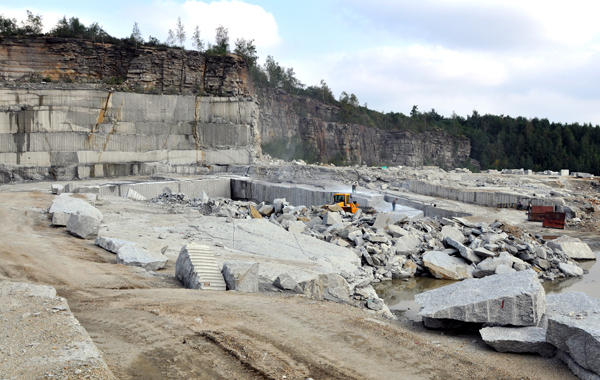 Given the number of quarries that are still in operation we are sure that we can expect some more interesting finds in the future, and hope that we will soon be writing another update on Strzegom specimen production. Im so jealous now ,,,but in good sense..
Good luck in new search !!!!!! !